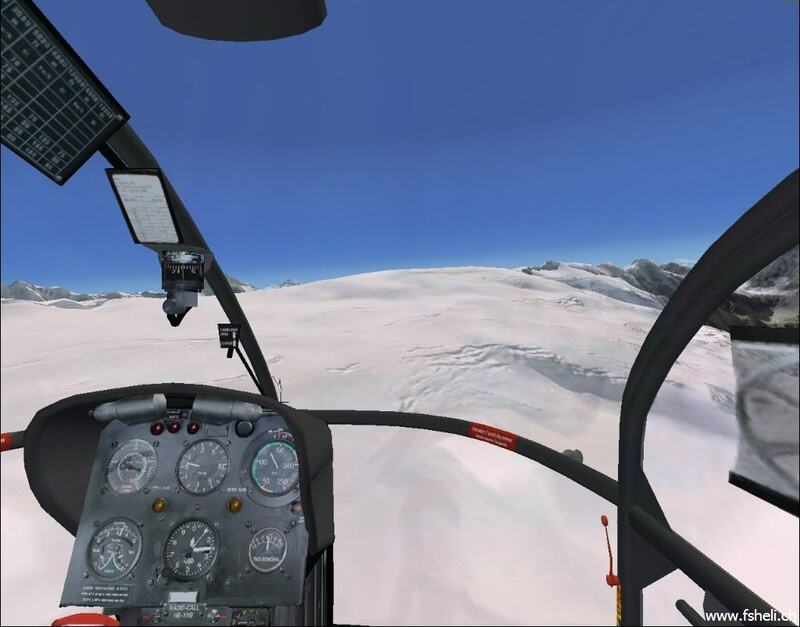 Swiss Alps sightseeing flight fly this one-hour trip with the SA313B departing from Bern-Belpoverhead Grindelwald, Eiger-Mönch-Jungfrau with a stop on the Petersgrat to fly back to Bern-Belp (LSZB). 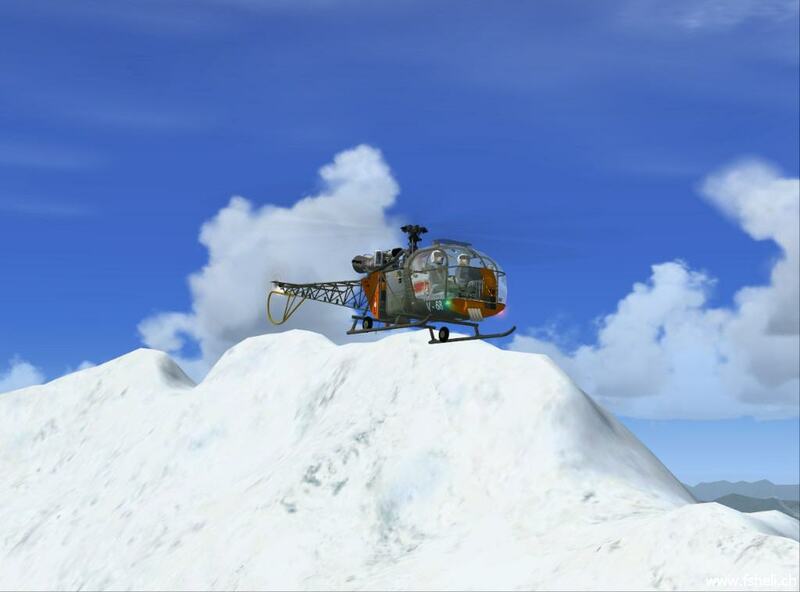 the Altitude world record about 10984 meters. 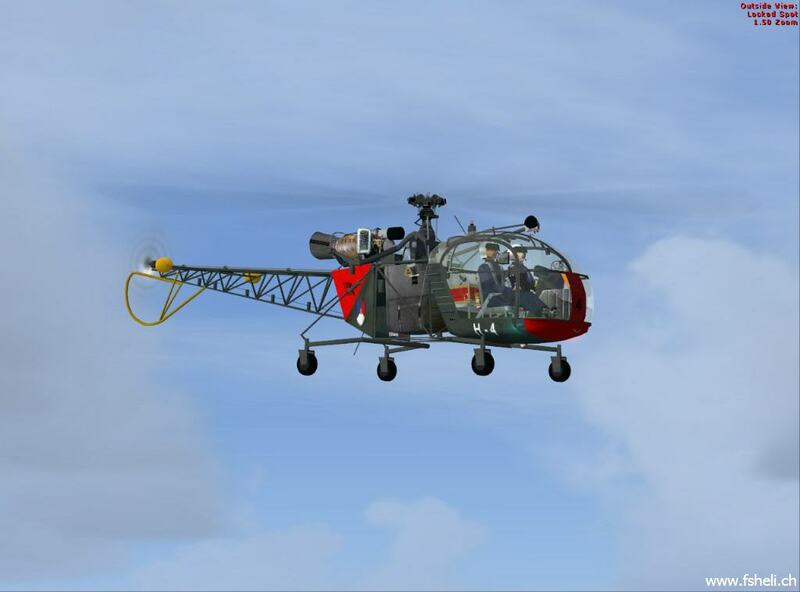 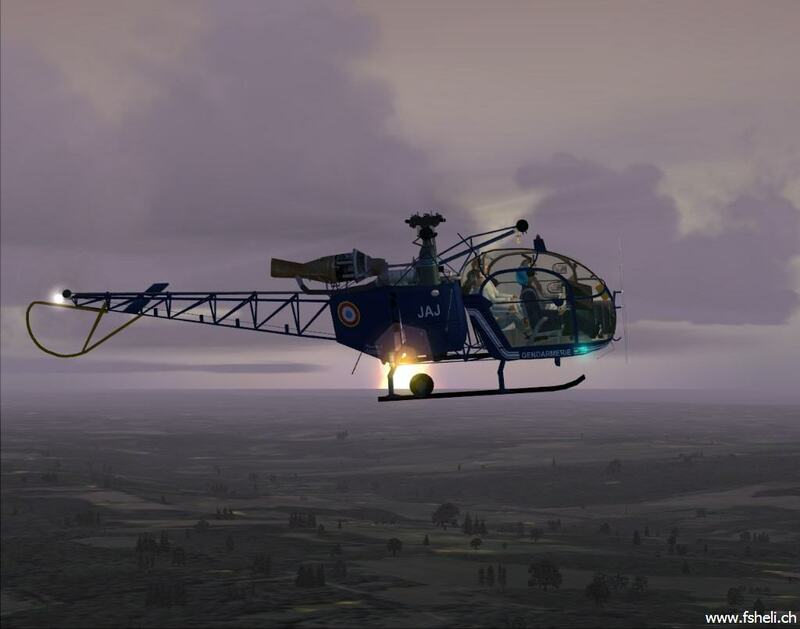 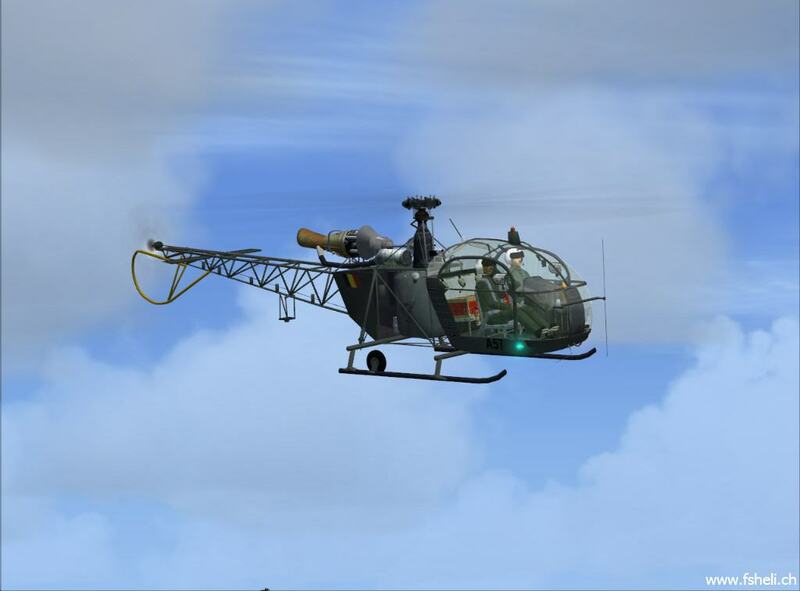 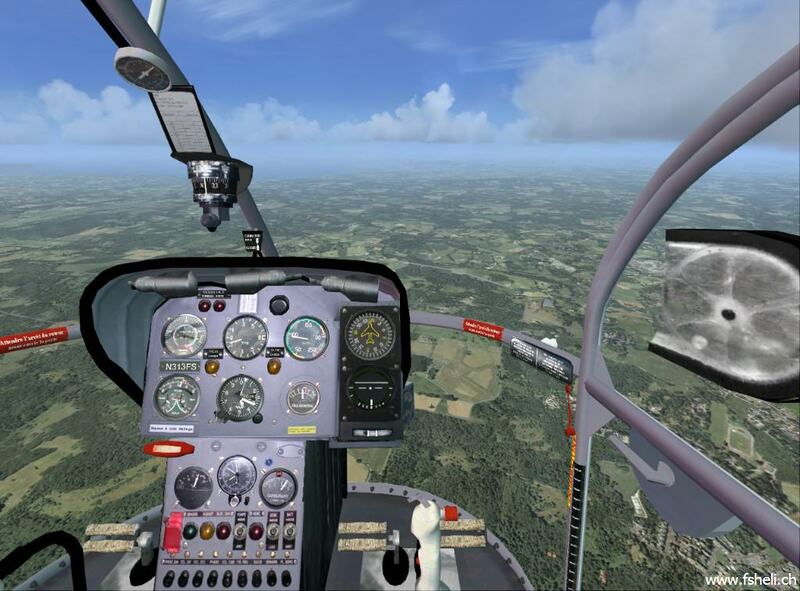 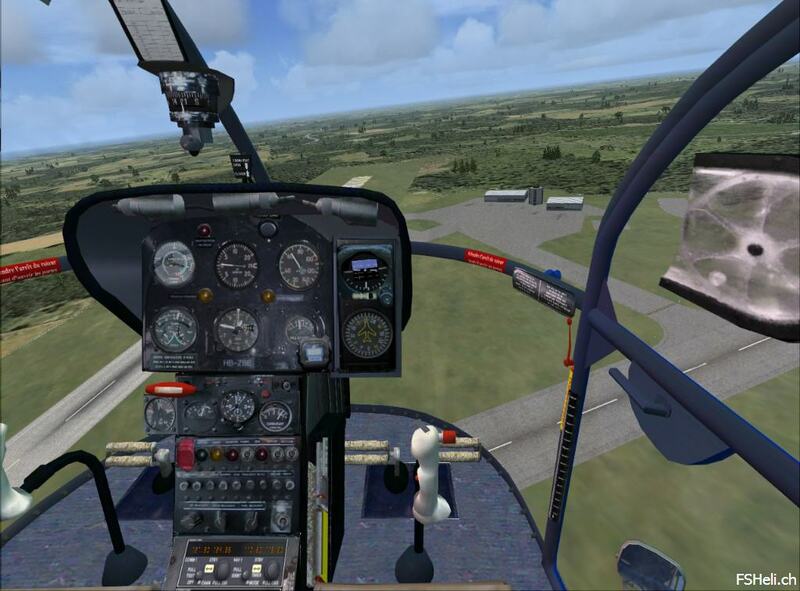 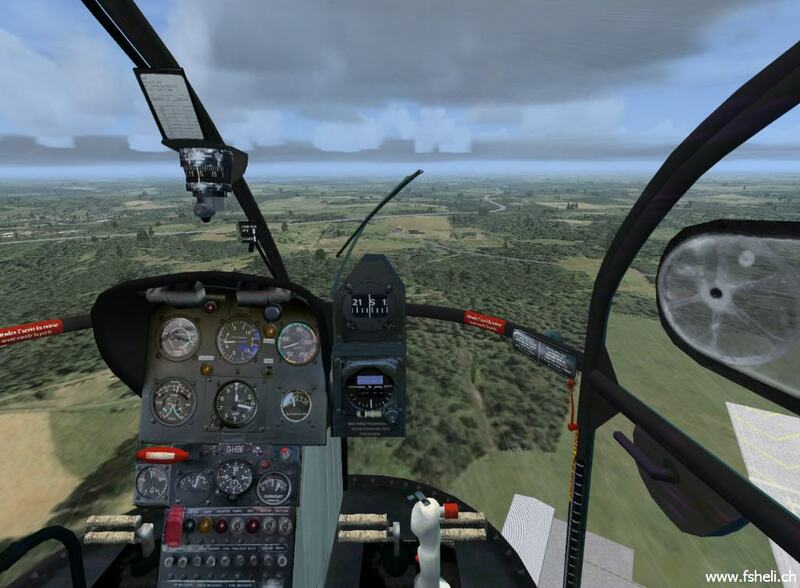 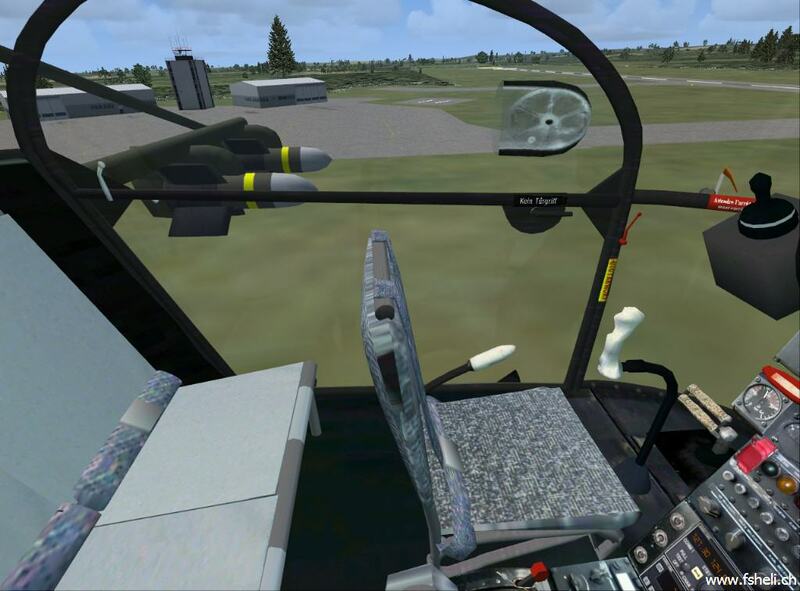 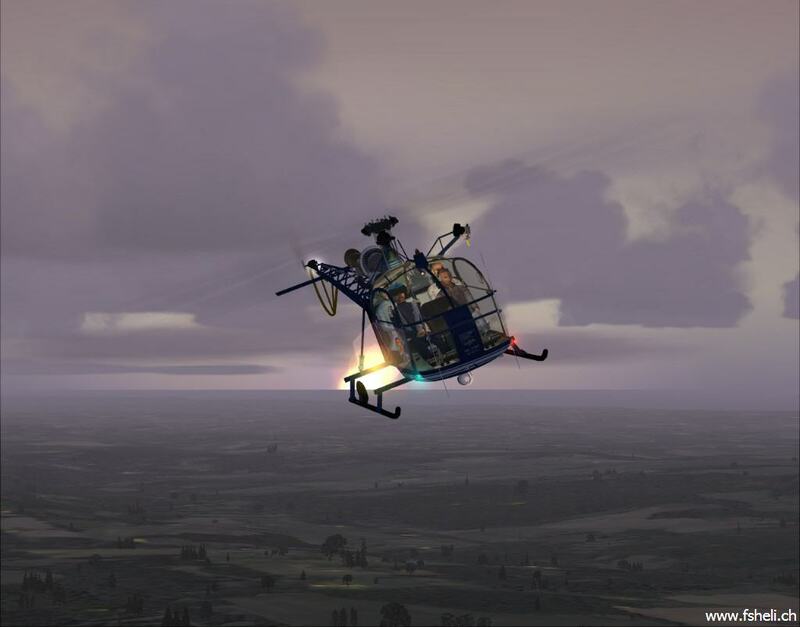 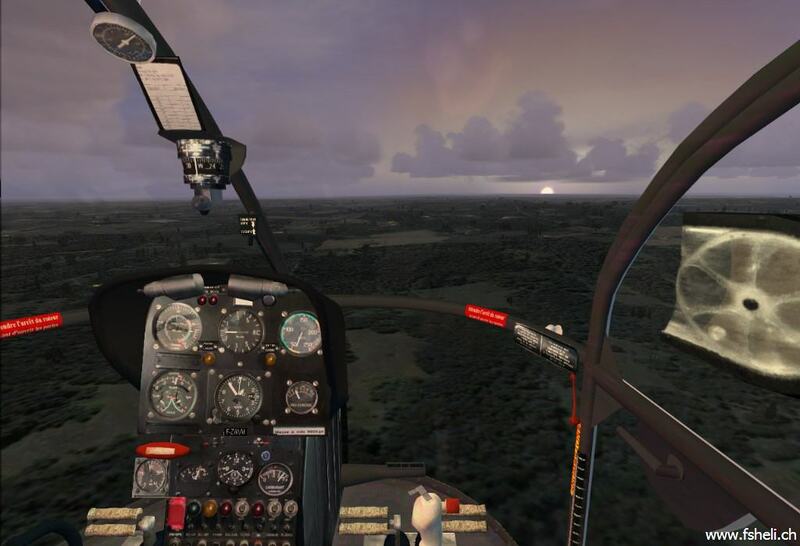 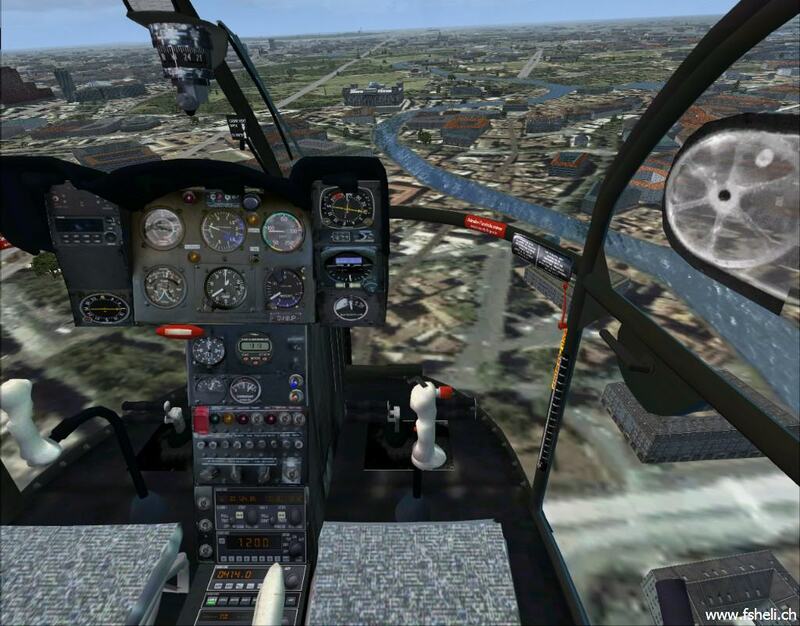 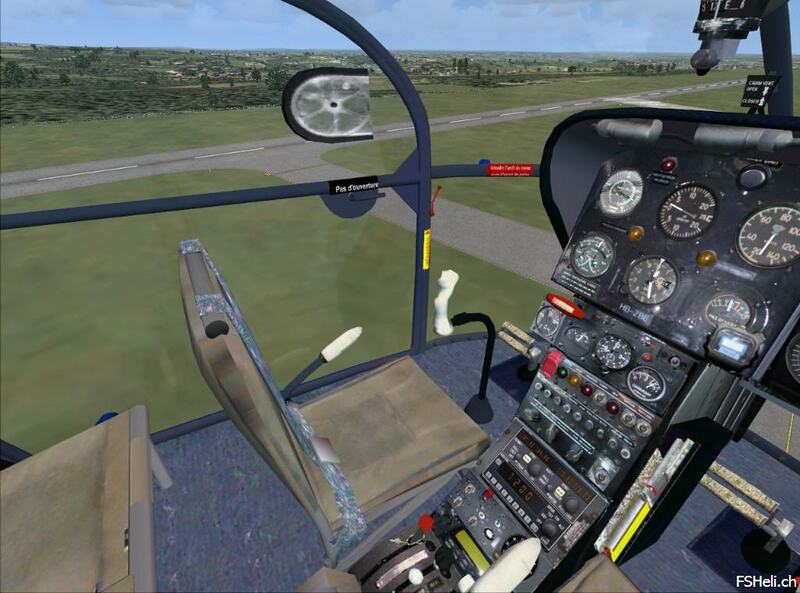 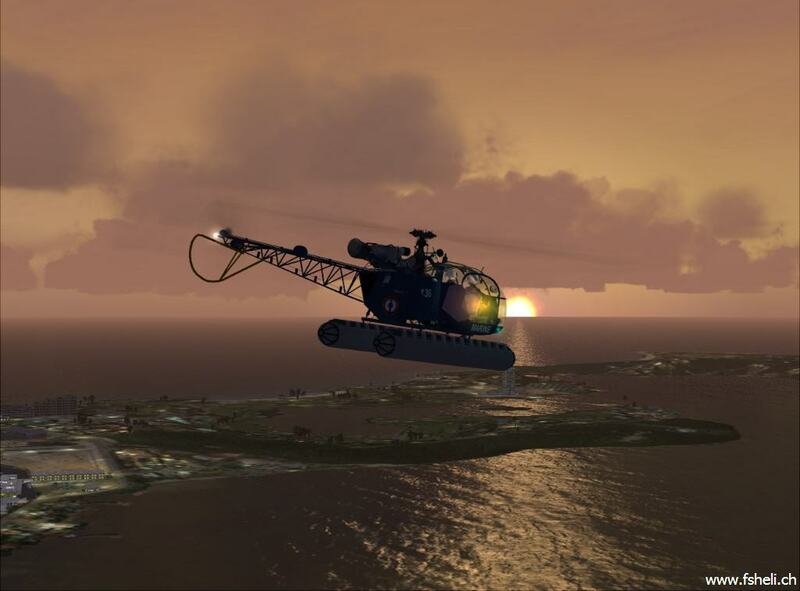 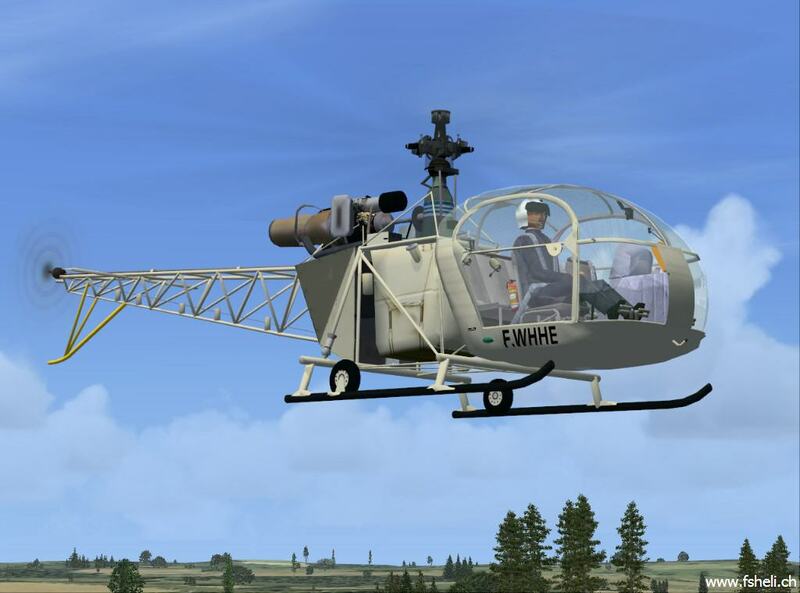 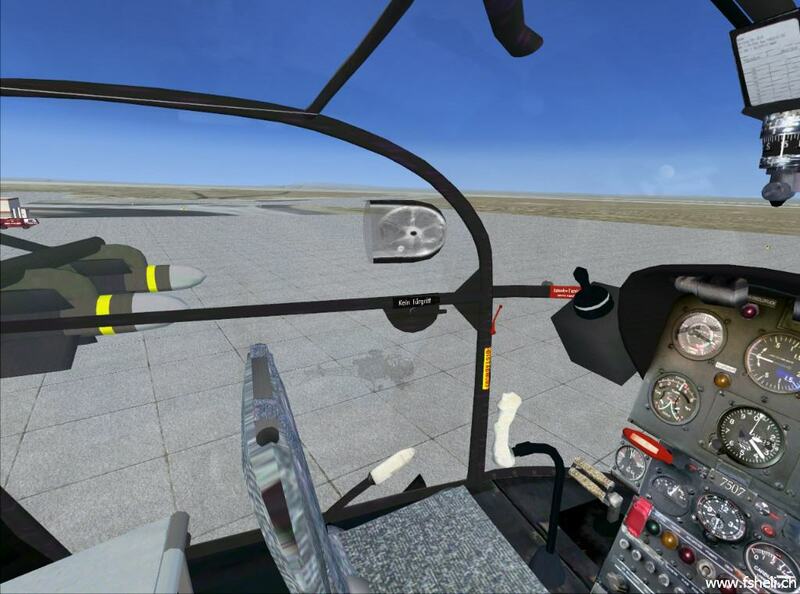 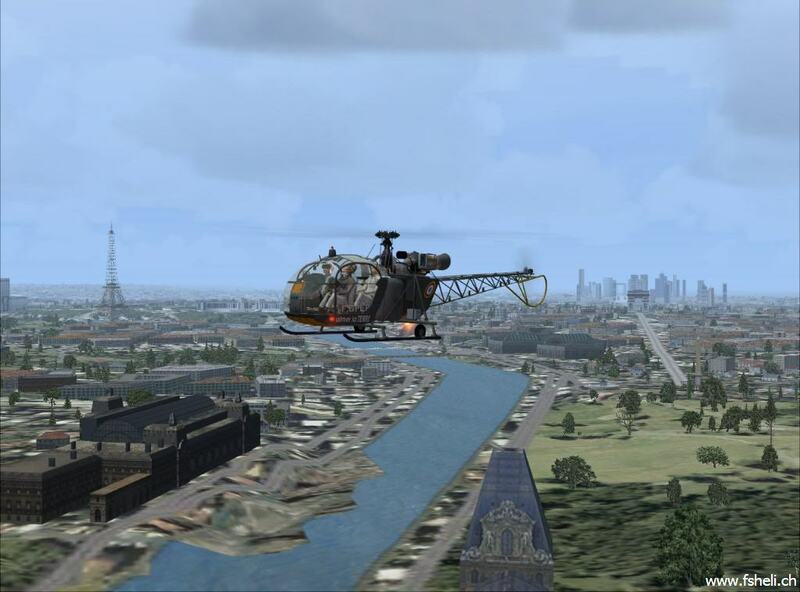 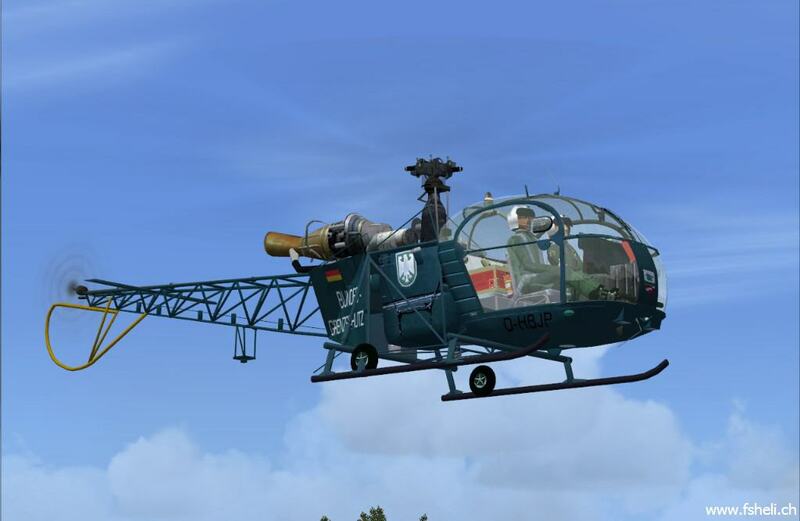 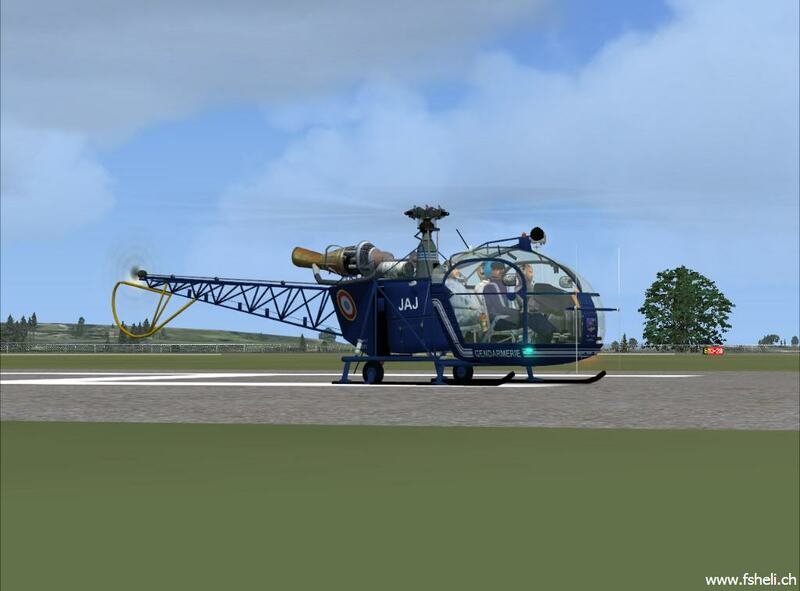 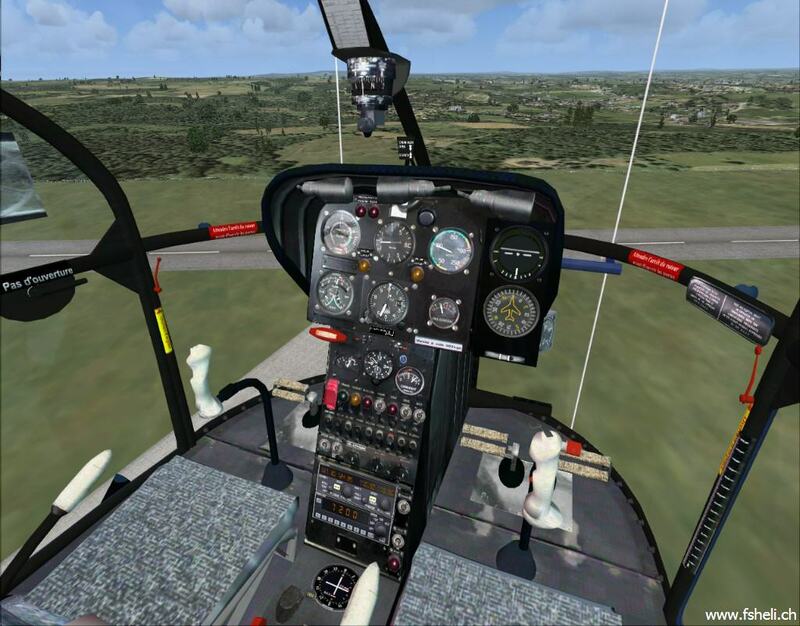 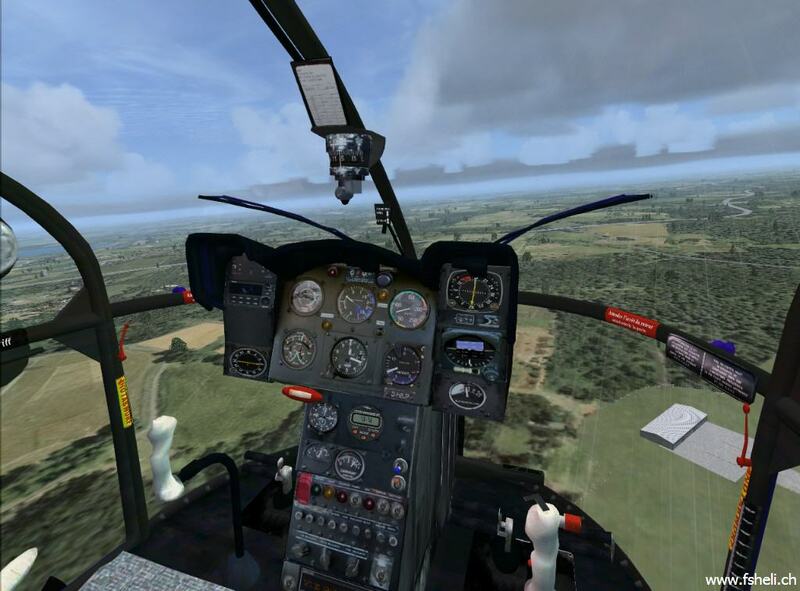 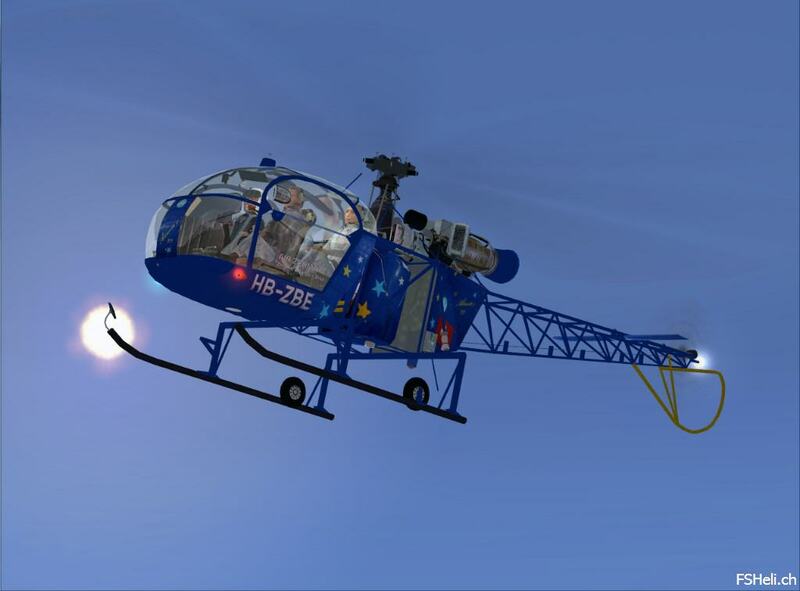 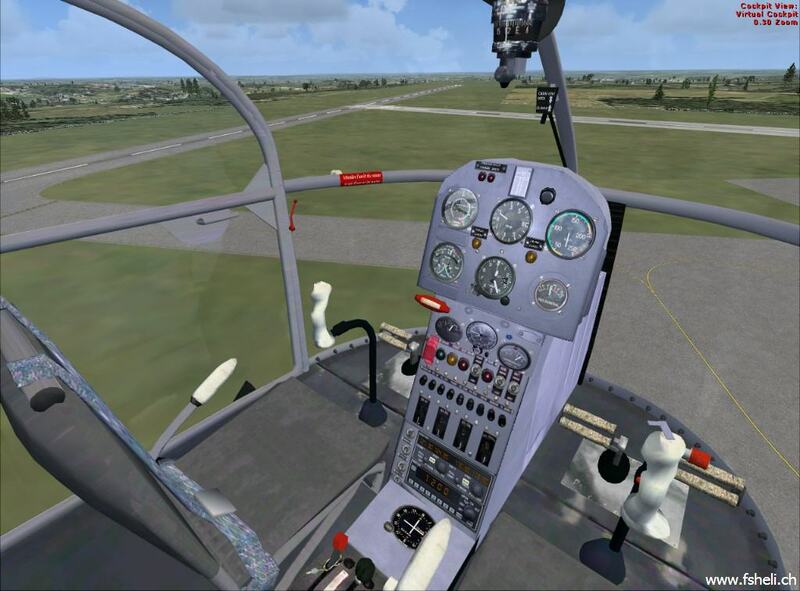 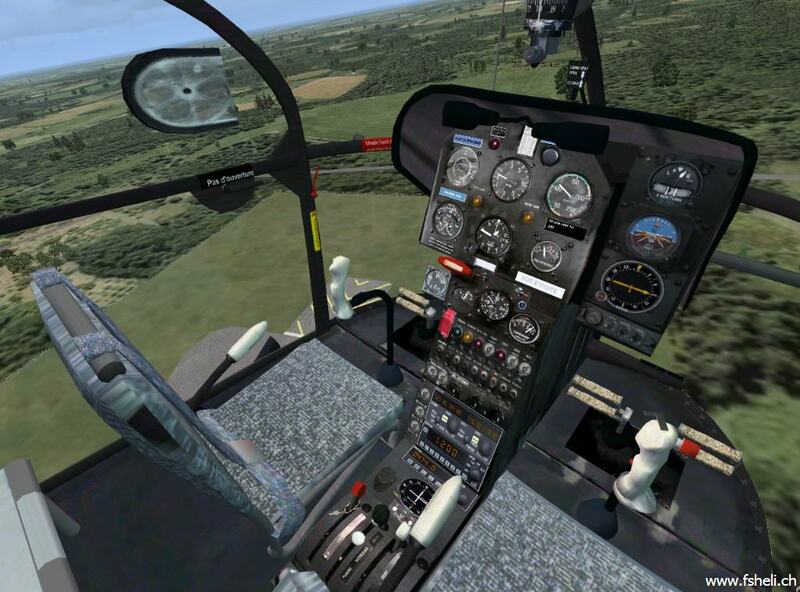 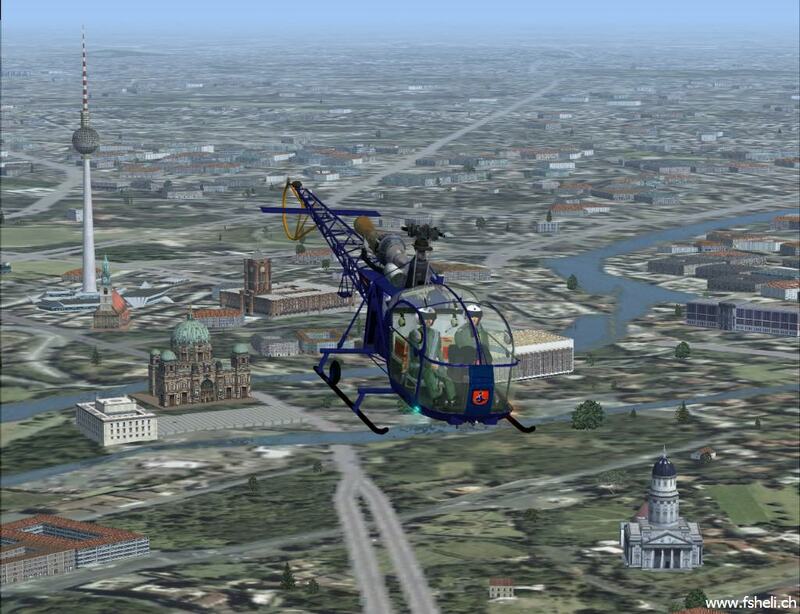 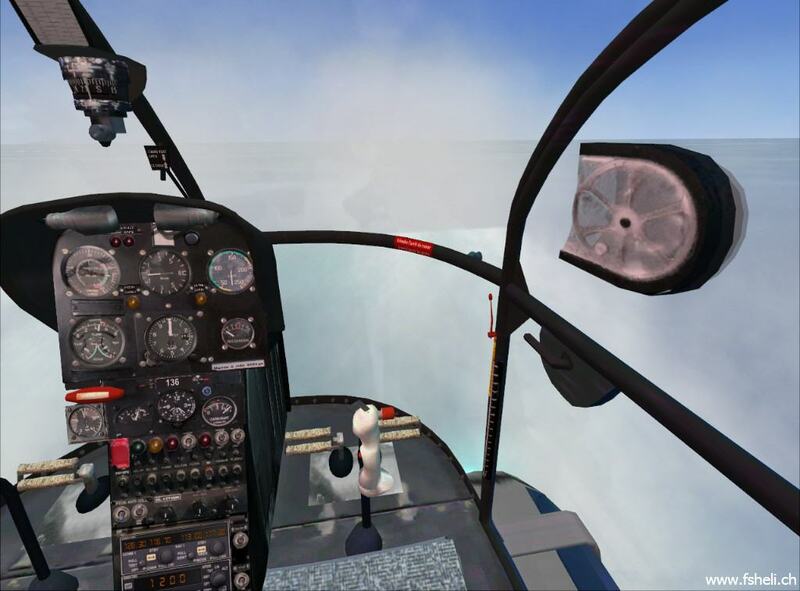 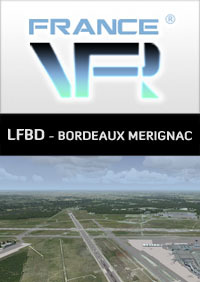 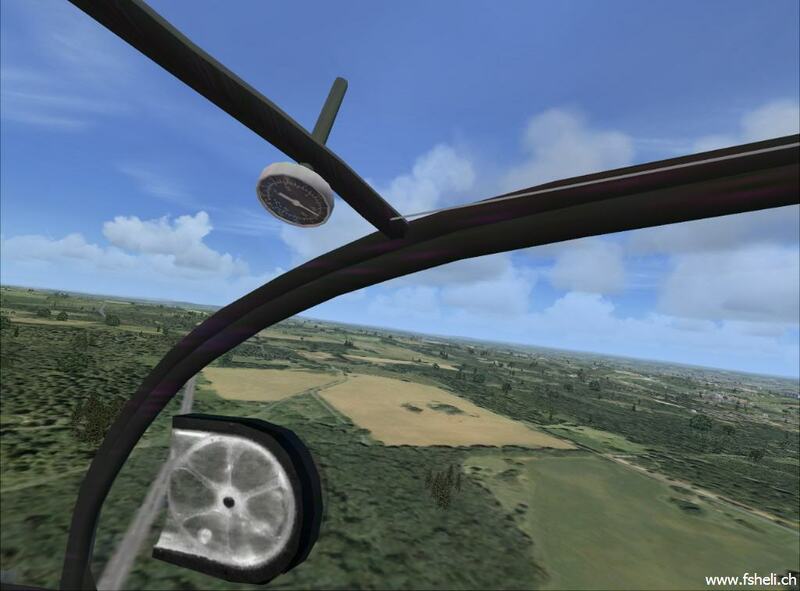 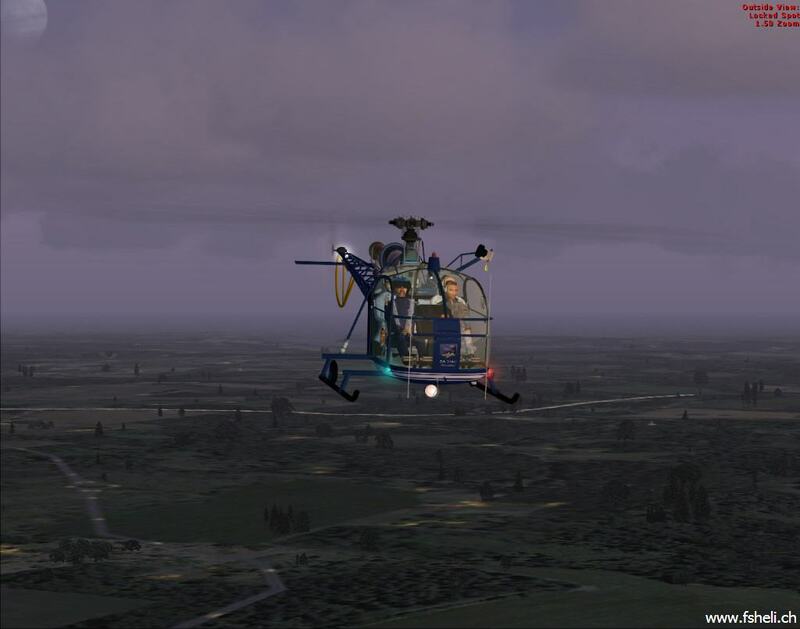 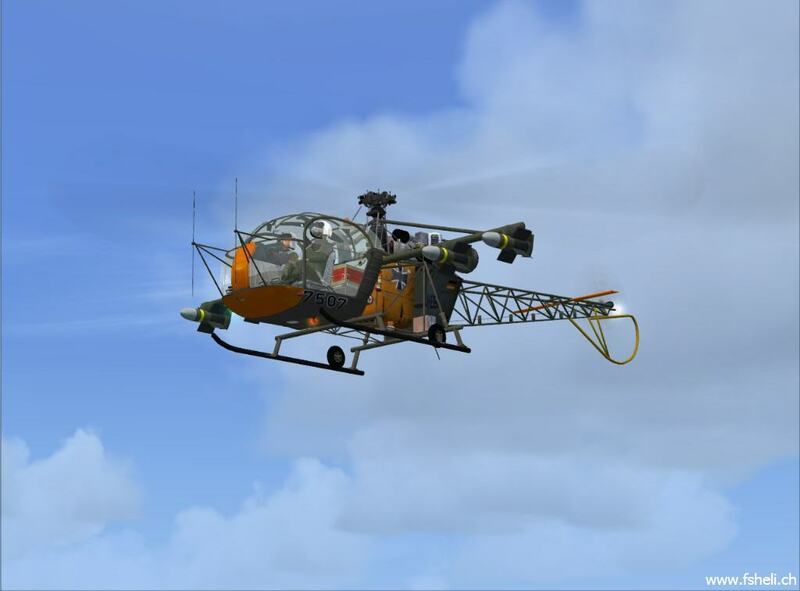 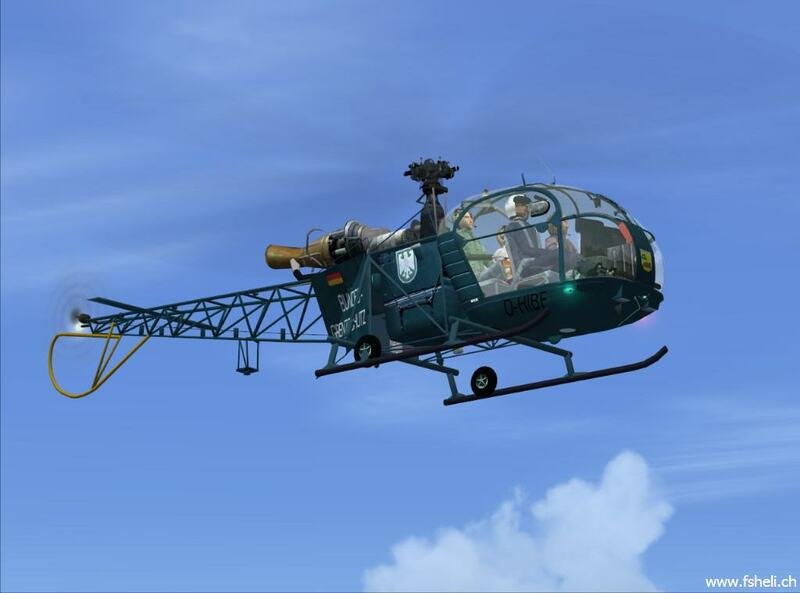 You are in command on the SE3150 s/n 002 and you’ve got just enough fuel to climb over Bretigny-sur-Orge, the landing are in auto-rotation without engine. 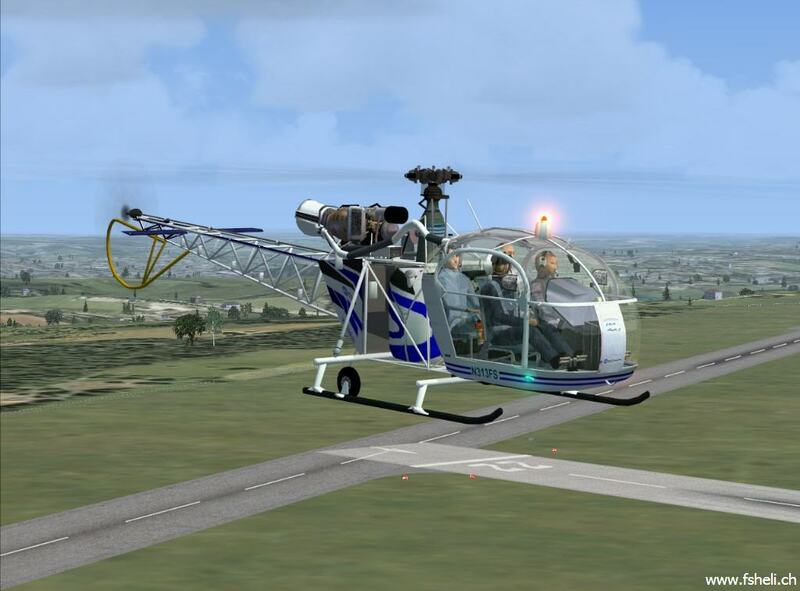 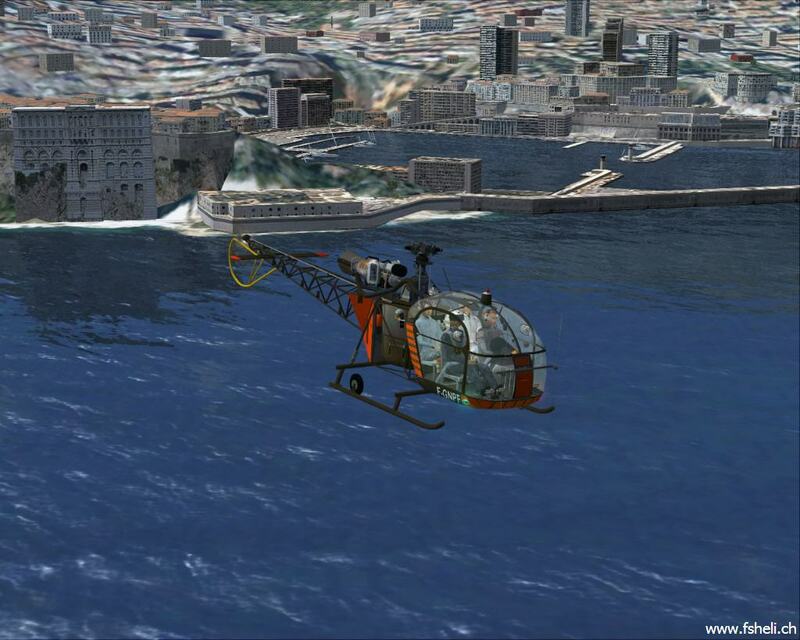 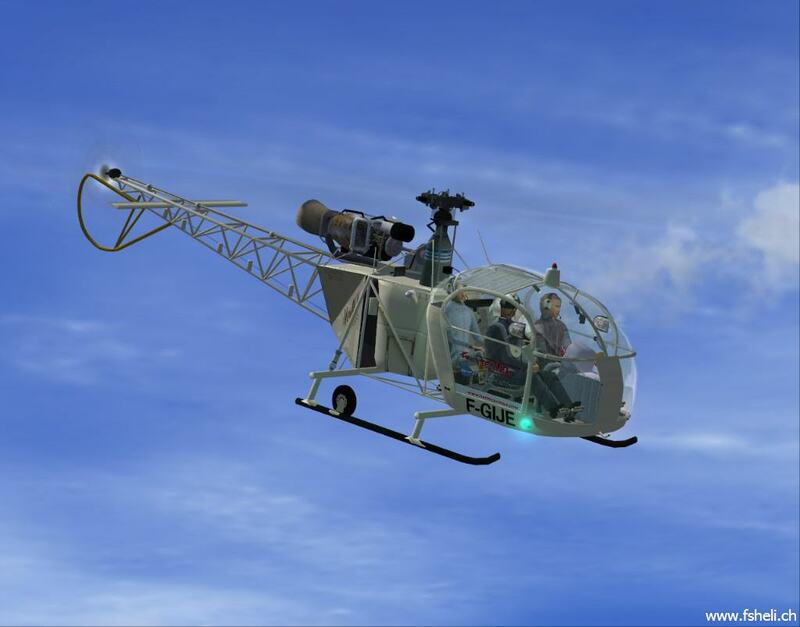 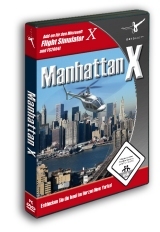 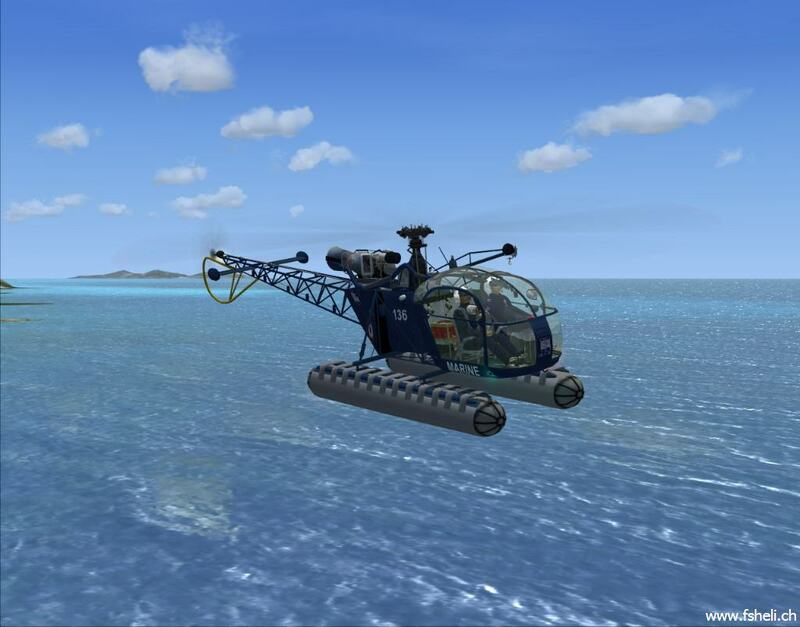 In as far as price for FSX choppers go, this is definitely giving you your money’s worth. 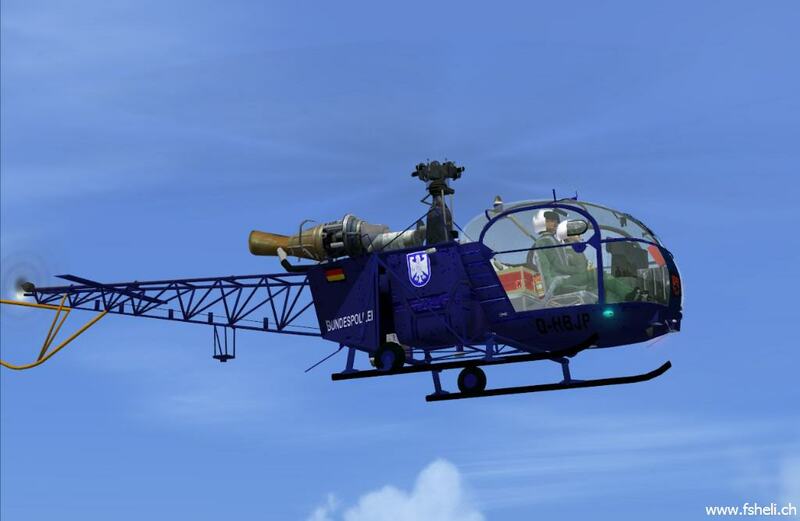 However, I'm not a fan of multi-livery aircraft add-ons that supply more than 2 or 3 variants. 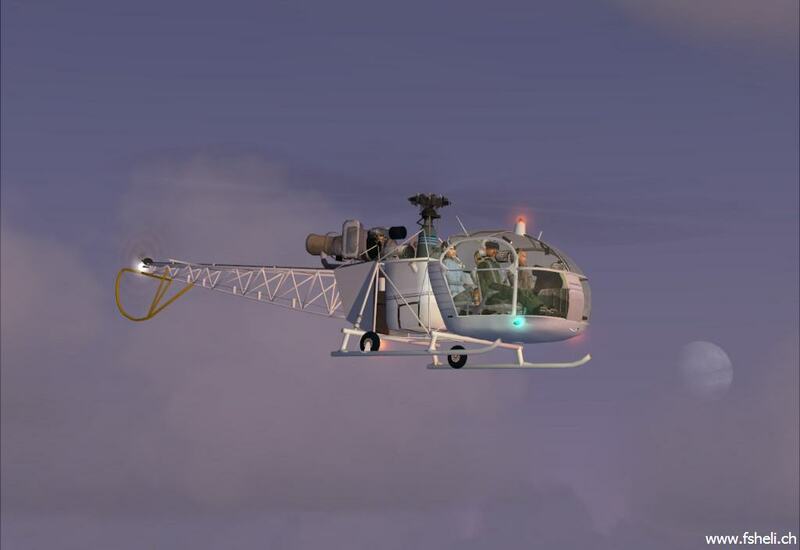 I'd at least like to have option to choose which and how many of the livery/products offered so I don't wind up with this huge list of unending, repetitive versions that mostly contain paint job variants. 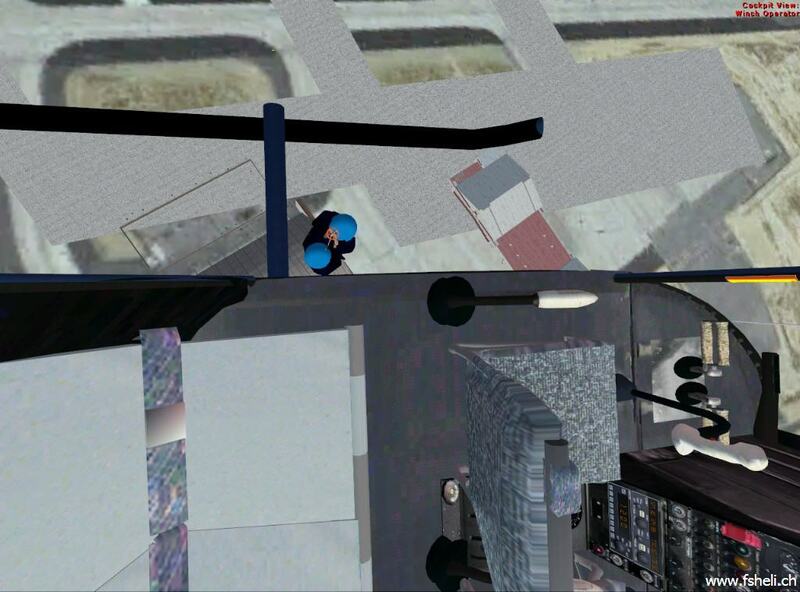 That said, it seems most developers are doing that nowadays, so I didn't strike down any points for that here. 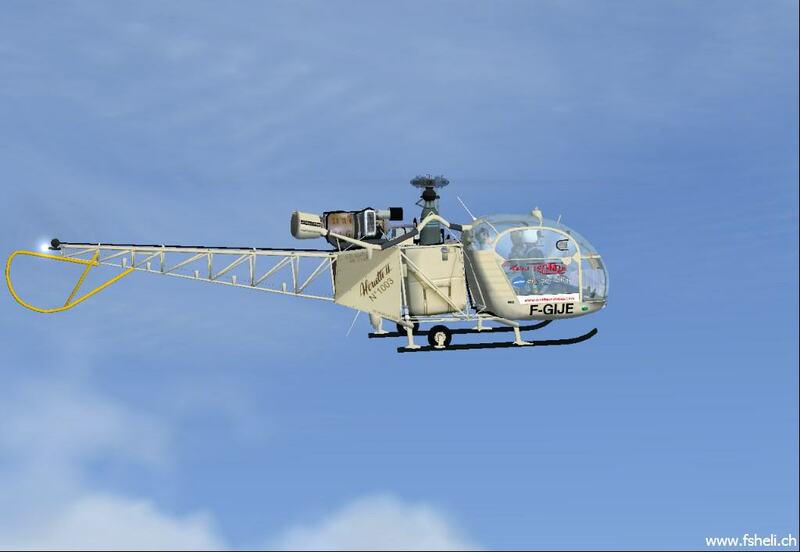 But most of the 2 stars that I did take off had to do with the incredibly irritating sound of this thing. 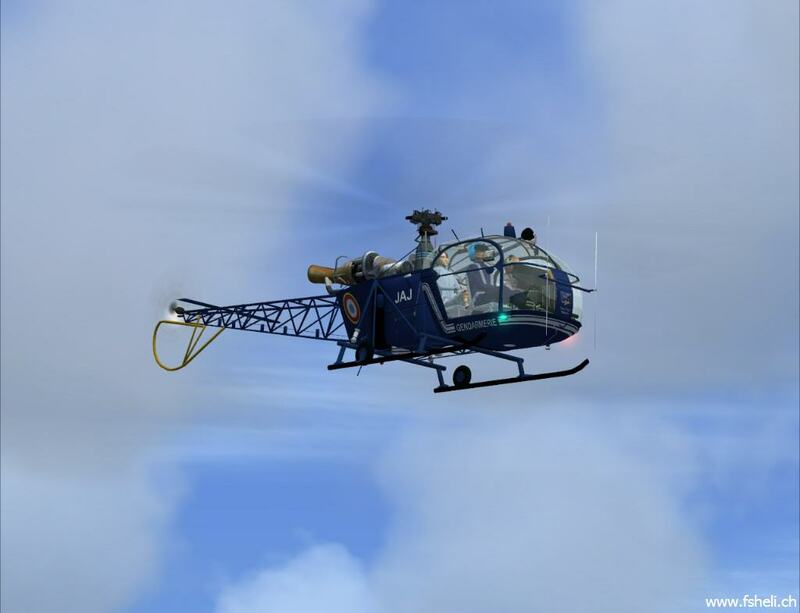 I know the Alouette had a high pitch sound in real life but some FSX add-ons should not try to duplicate the sound of the aircraft so closely when it's such an uncomfortable noise to the sim pilot who may not have a headset or just plans a quick flight so doesn't want to 'tune-out' the noise in the FSX panel, (which aside from being time consuming, is barely effective with FSX sound controls). 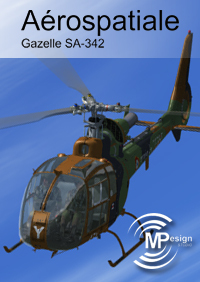 This isn't the only aircraft that has a terrible sound reproduction when heard through a 2.1 standard system. 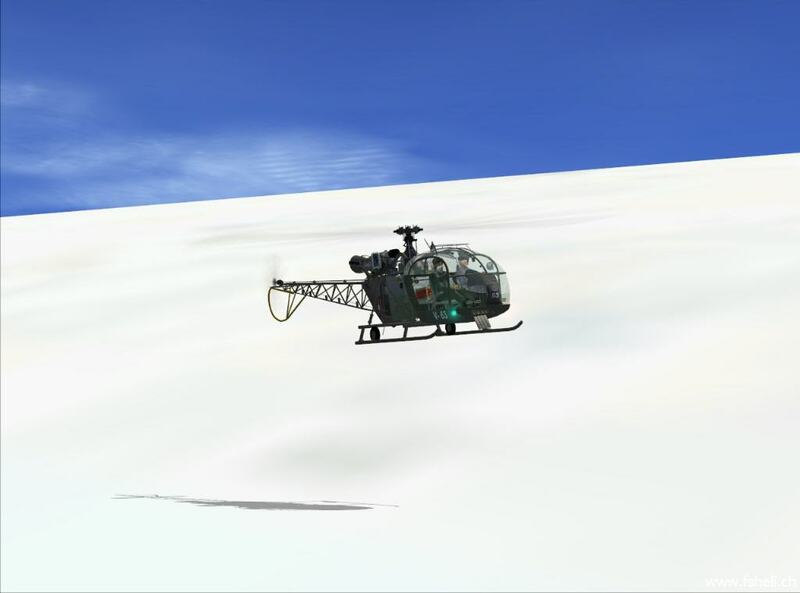 The relatively recent Razbam Harrier Jump Jet was so bad that I had to remove it until I had time to search an alternative replacement sound package. 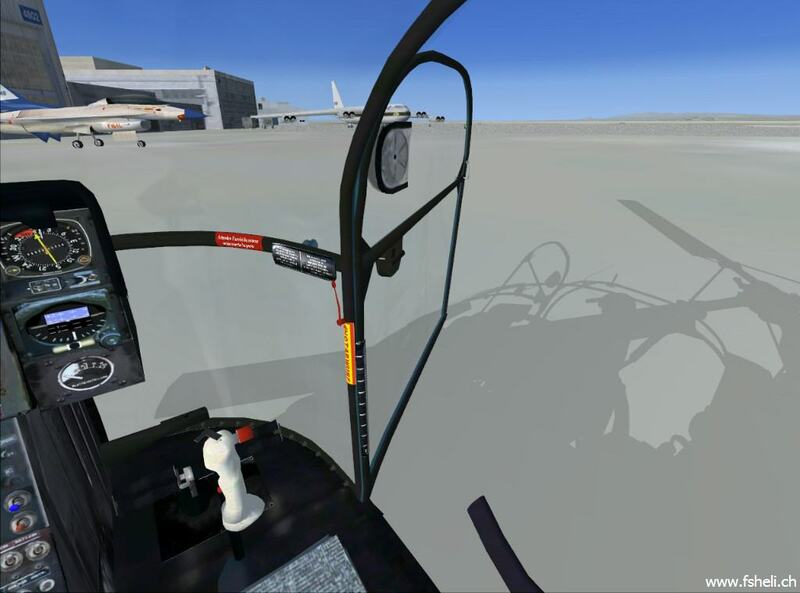 I've yet to do that and will likely try using a F15E sound set and hope it works. 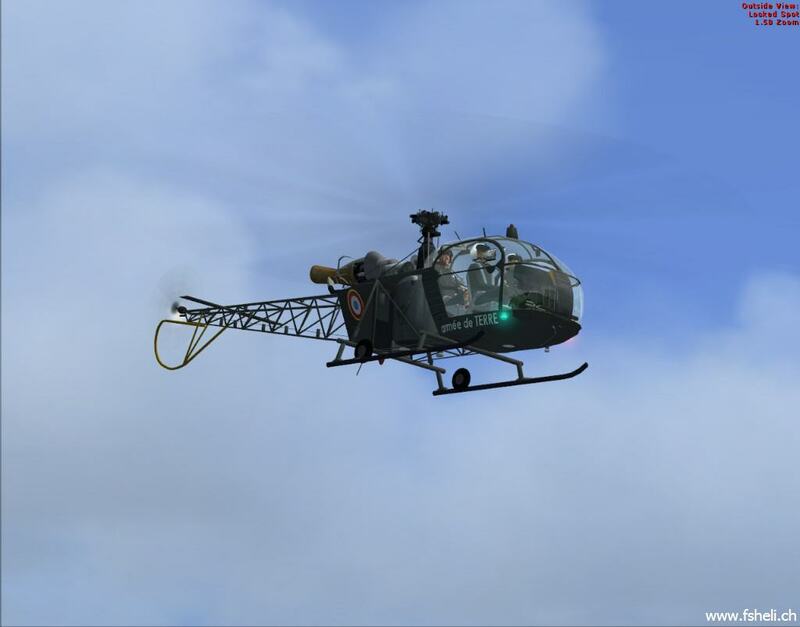 The Alouette's piercing, amplified mosquito-like, pitch took most of the two stars I forfeited but the interior's resolution took the rest. 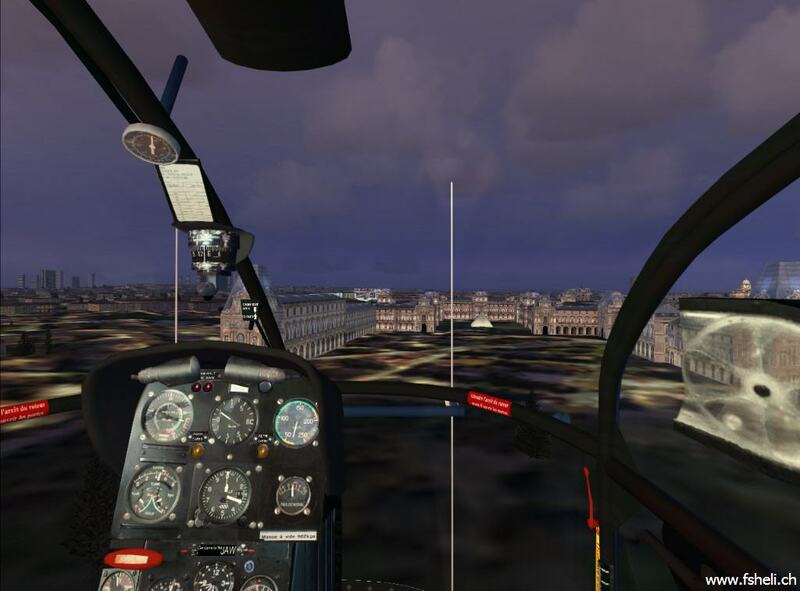 I felt that the amount of attention to detail given to the interior was half that of the exterior. 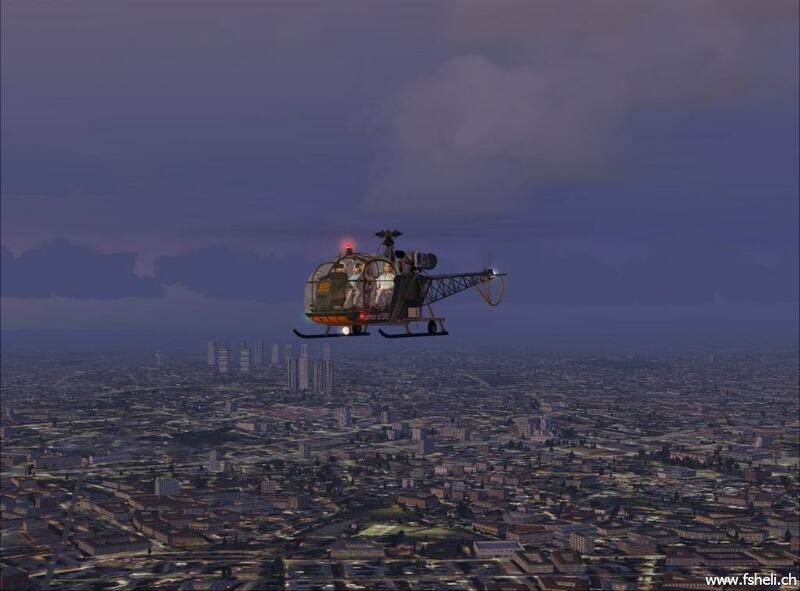 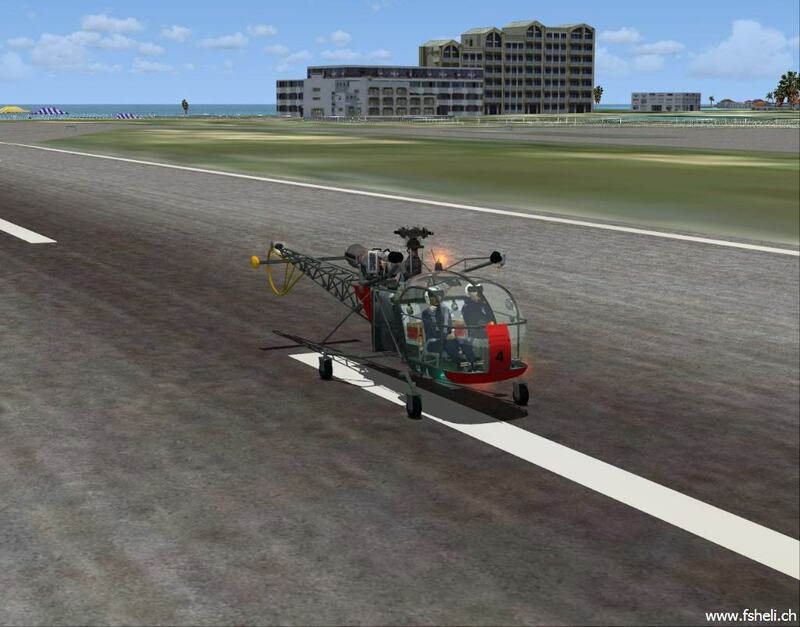 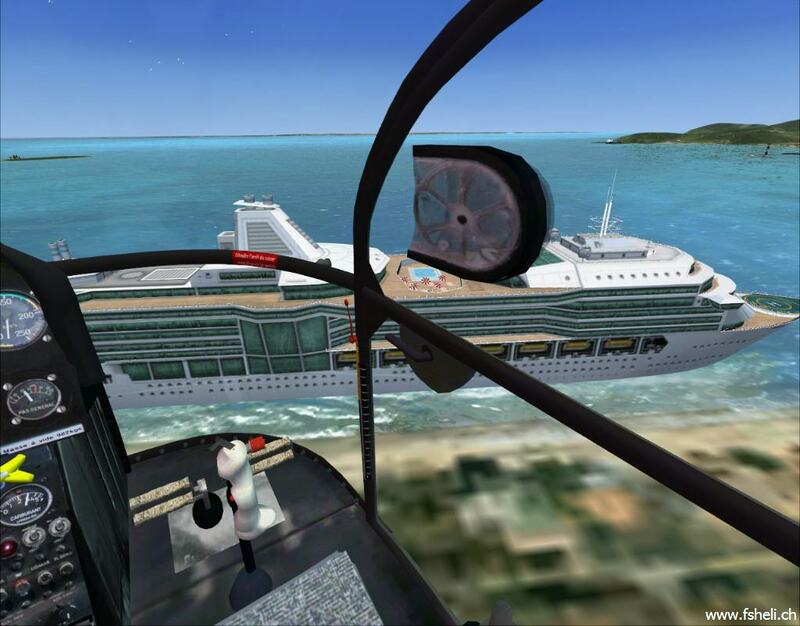 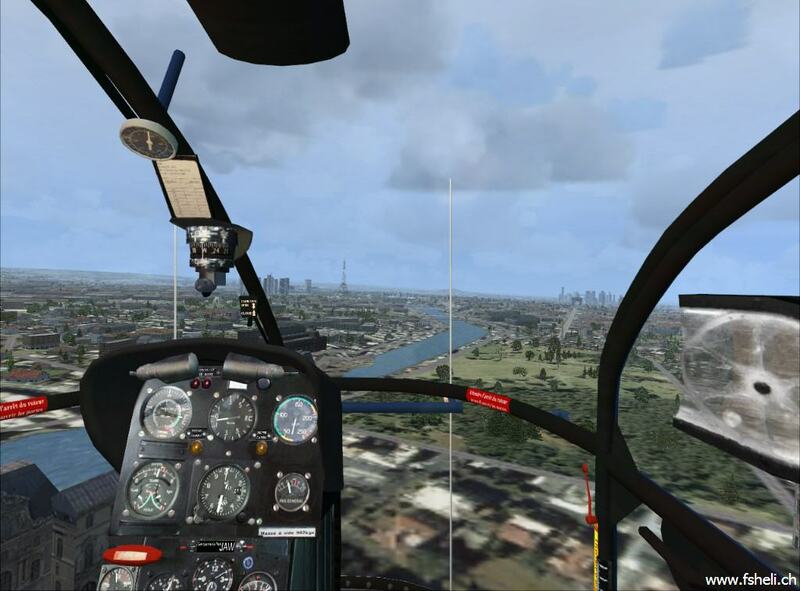 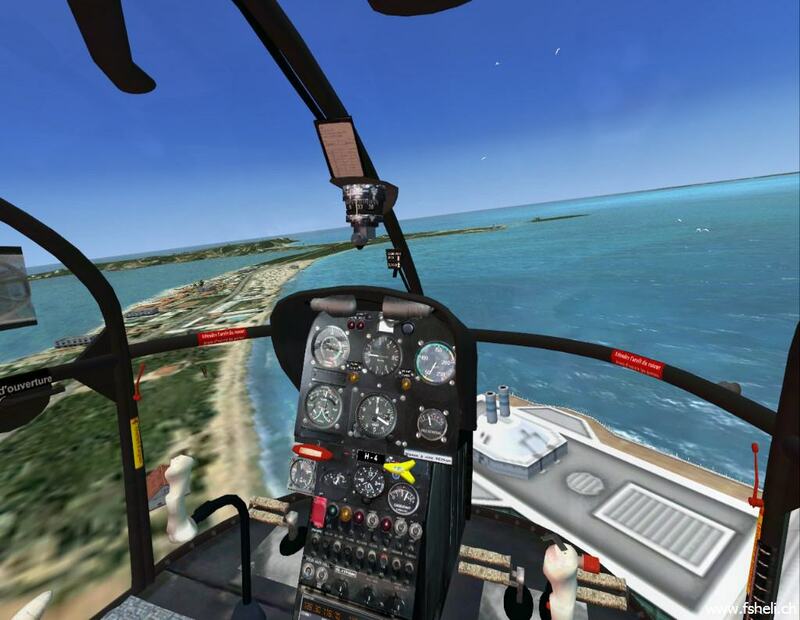 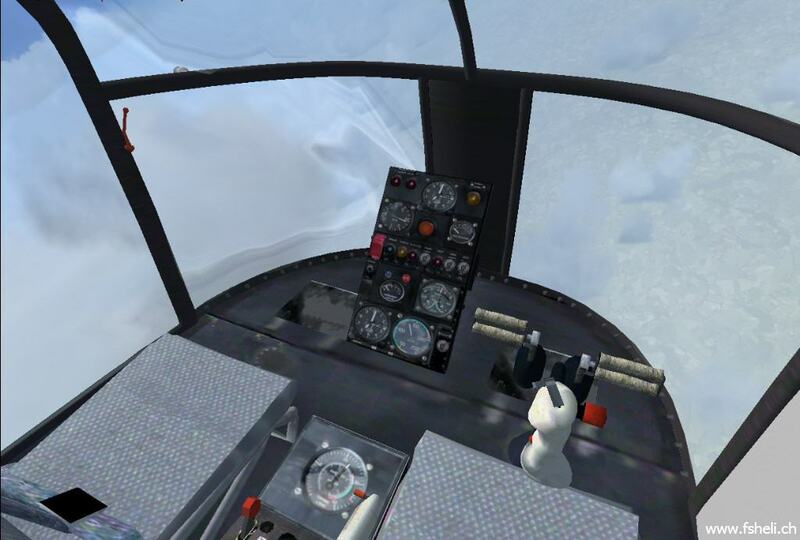 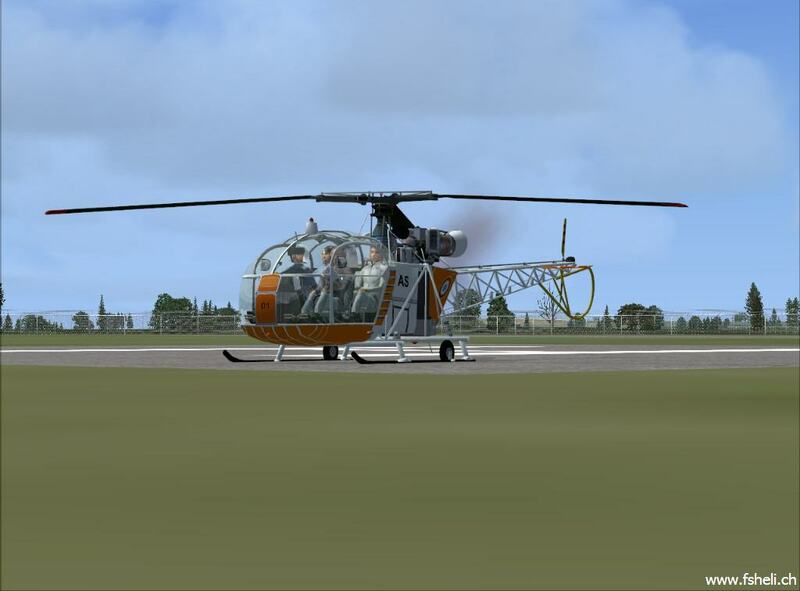 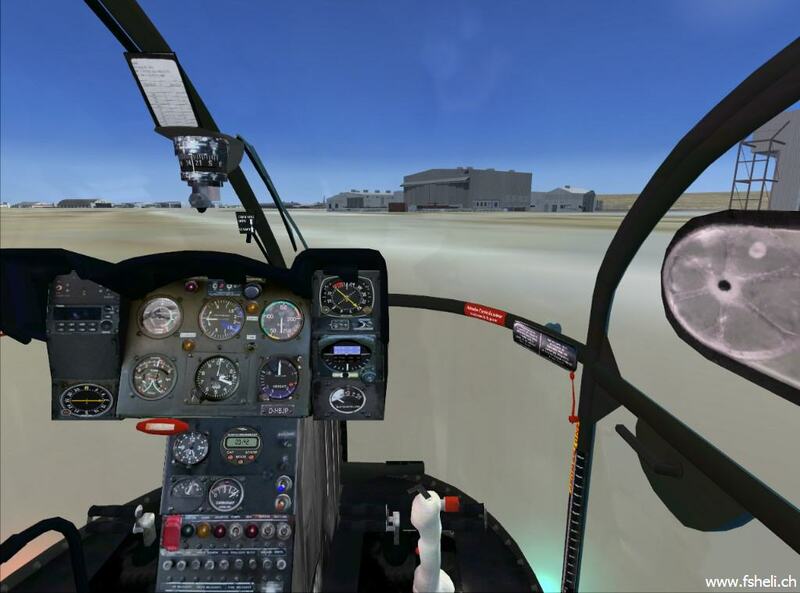 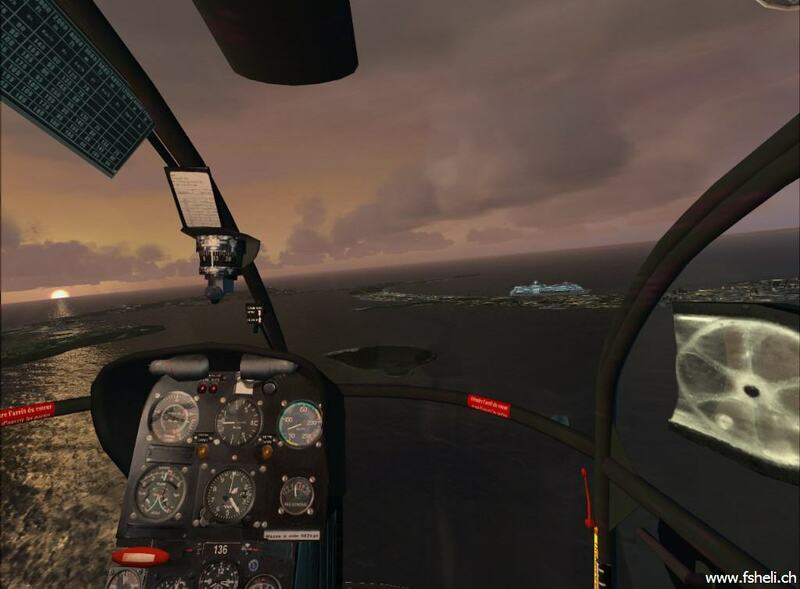 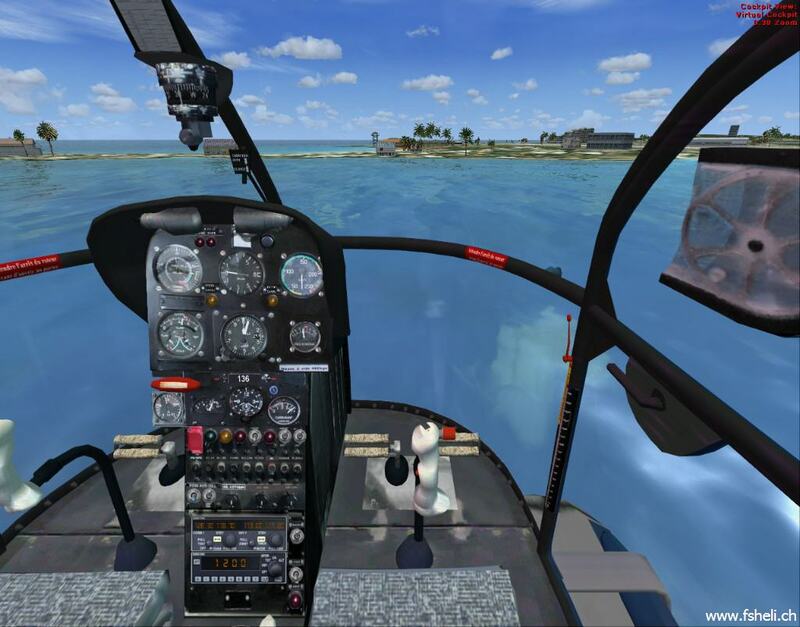 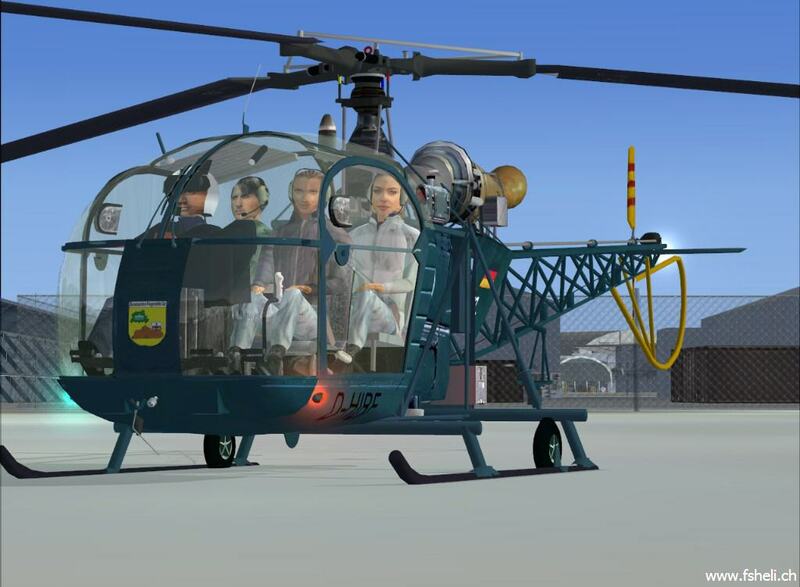 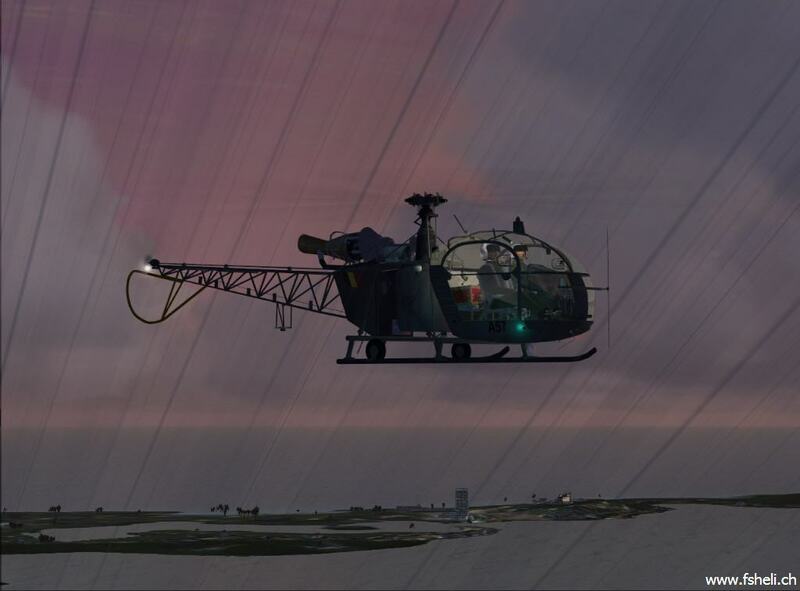 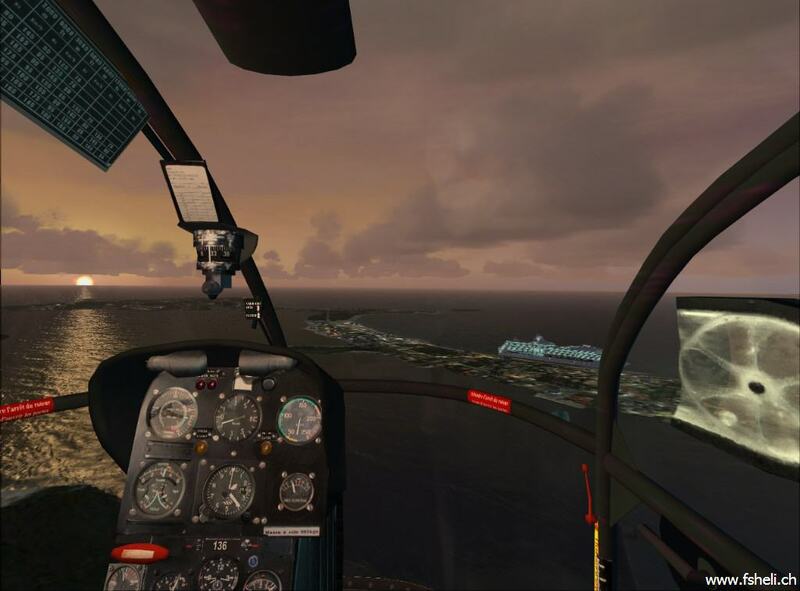 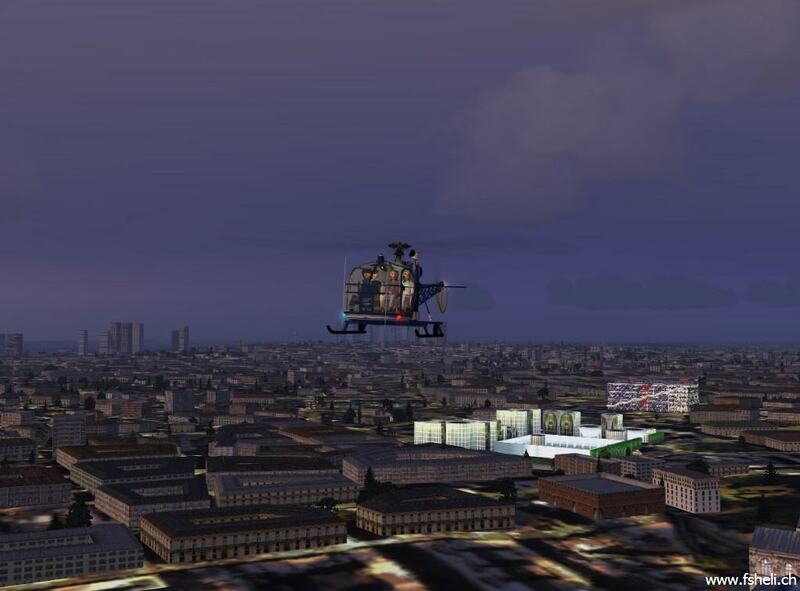 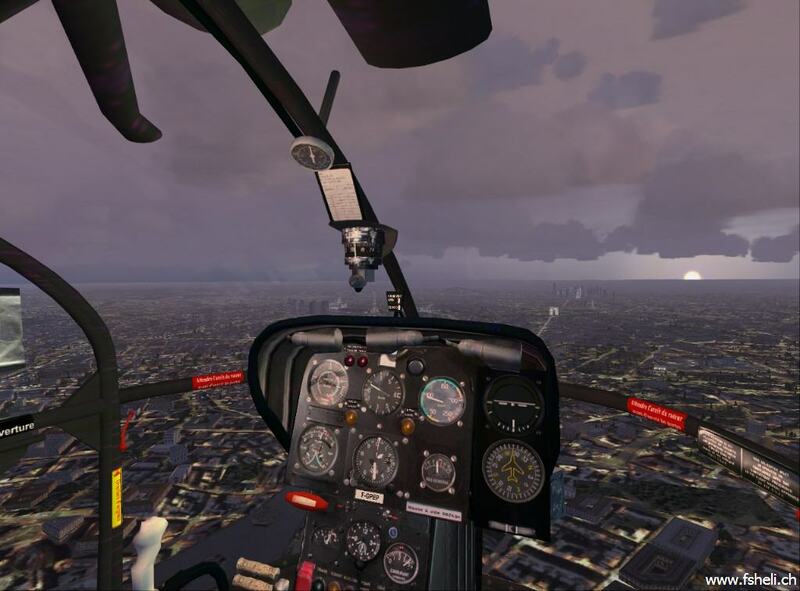 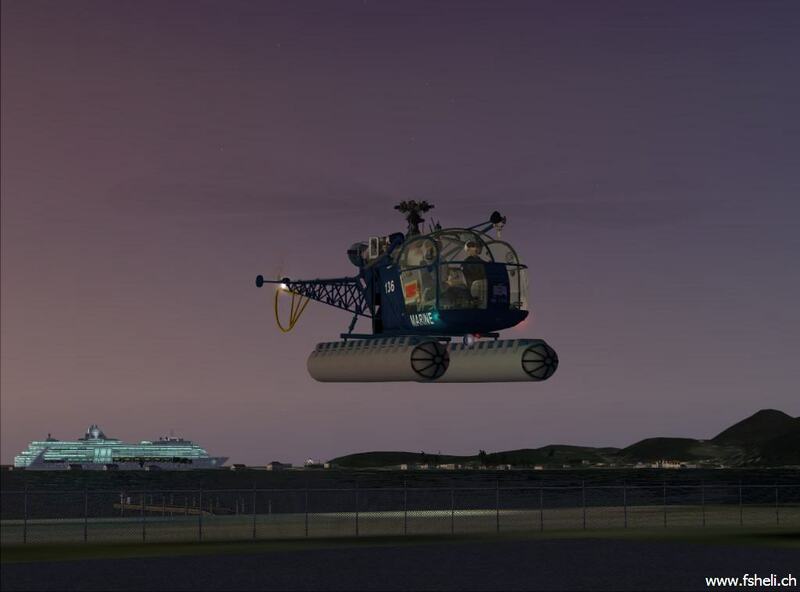 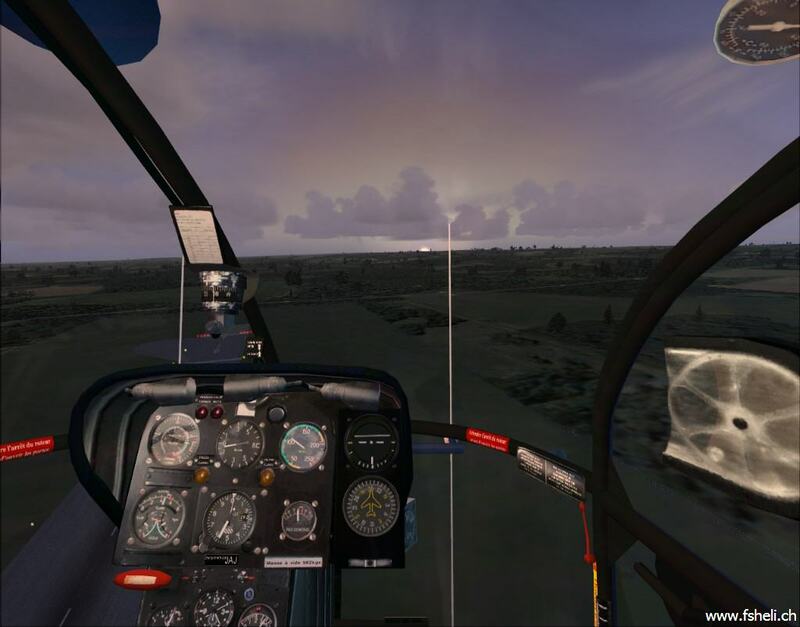 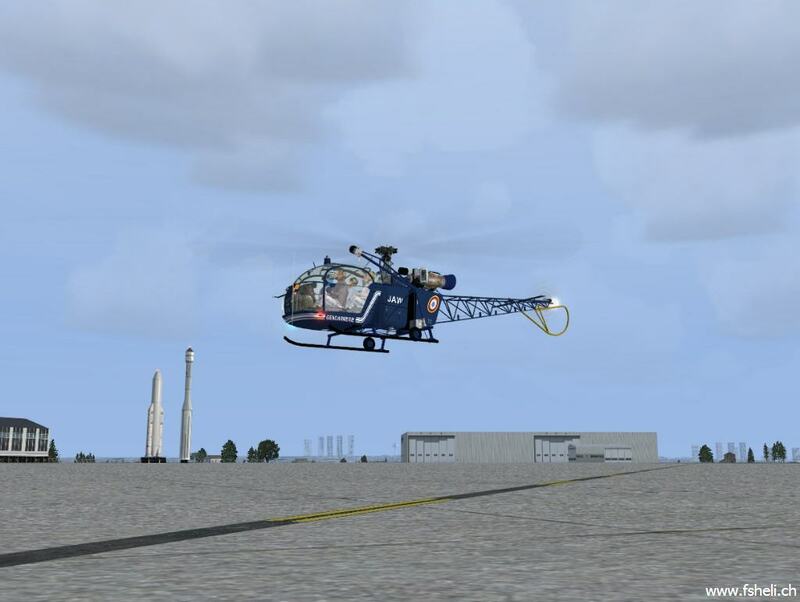 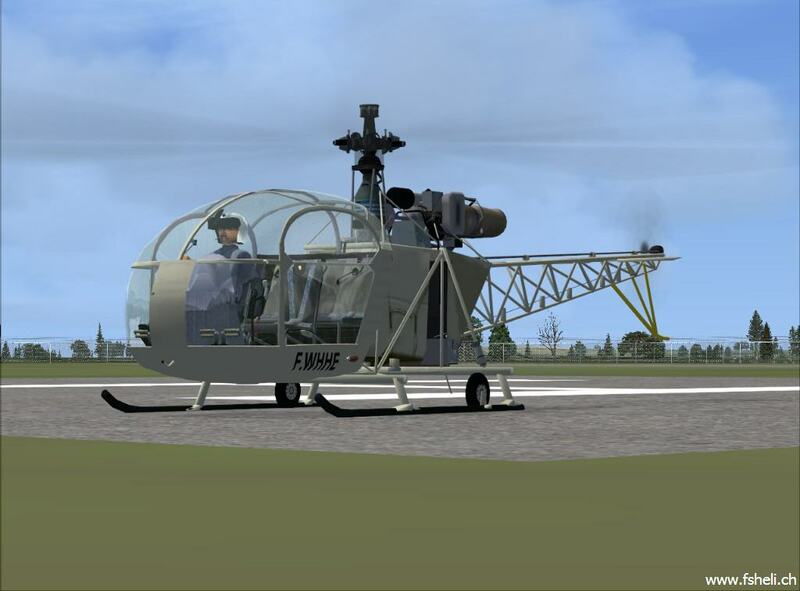 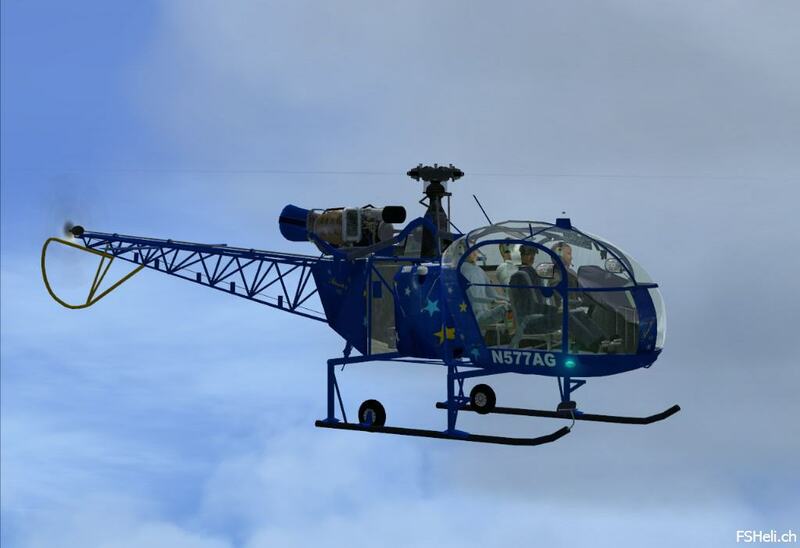 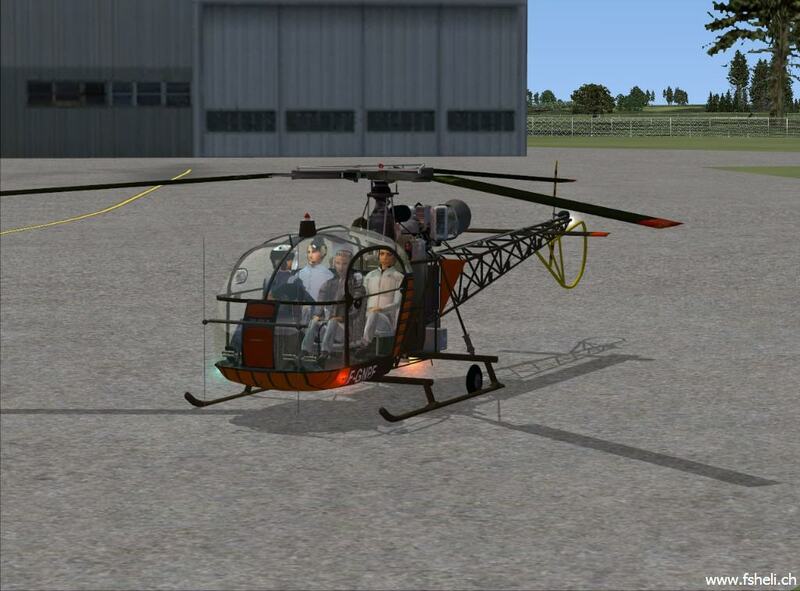 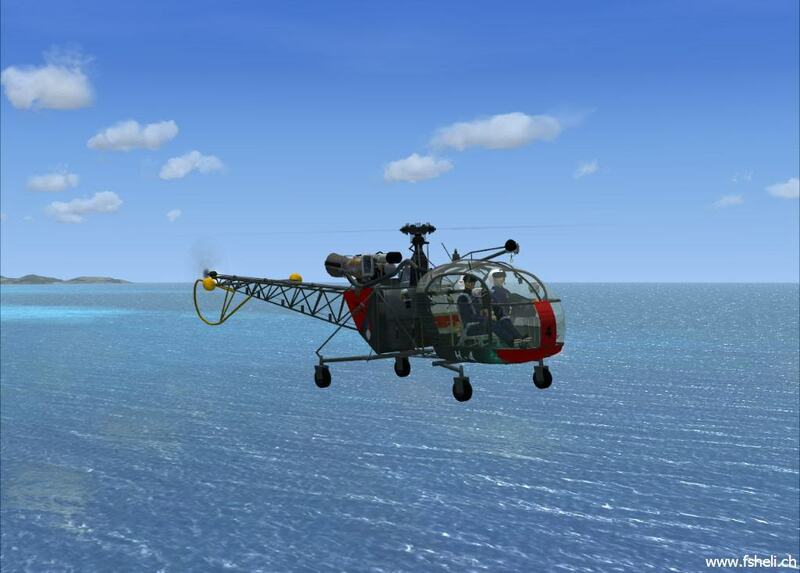 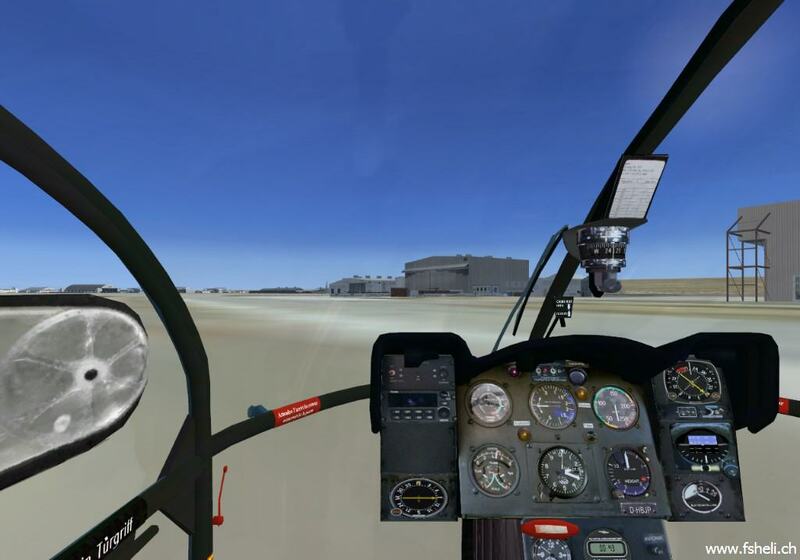 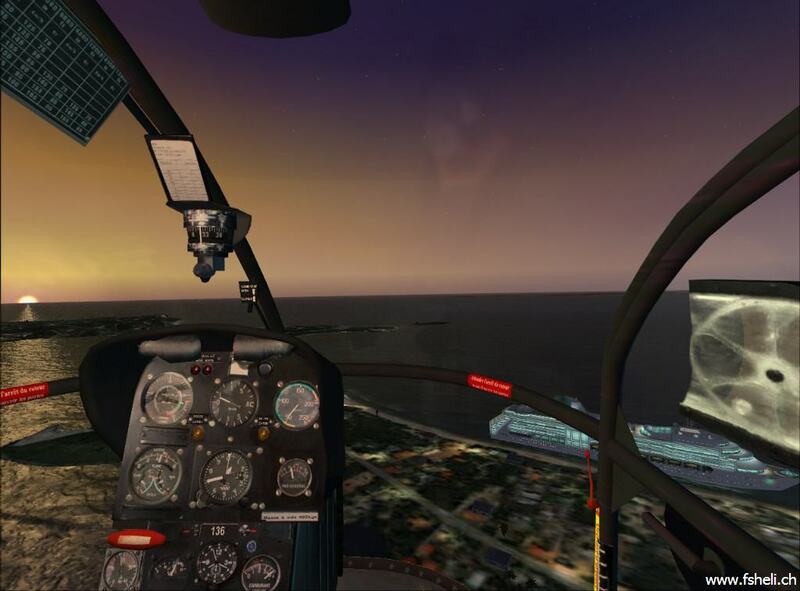 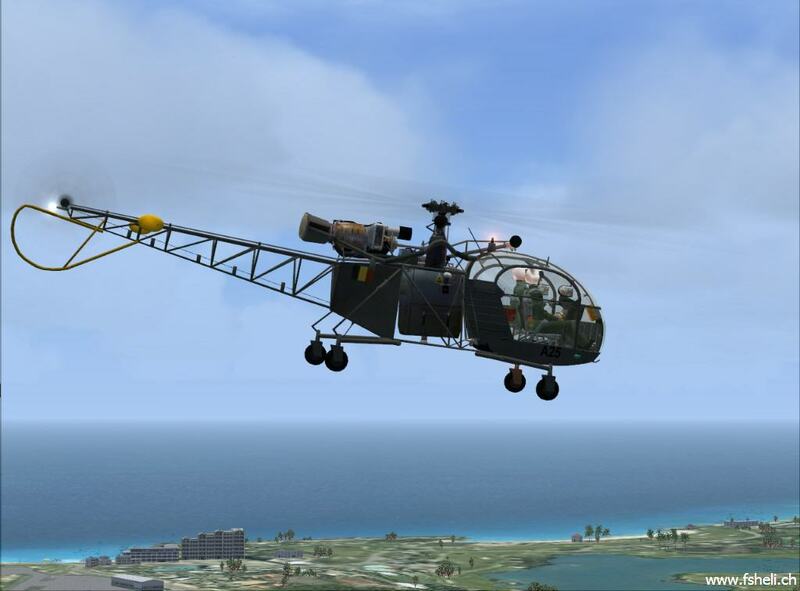 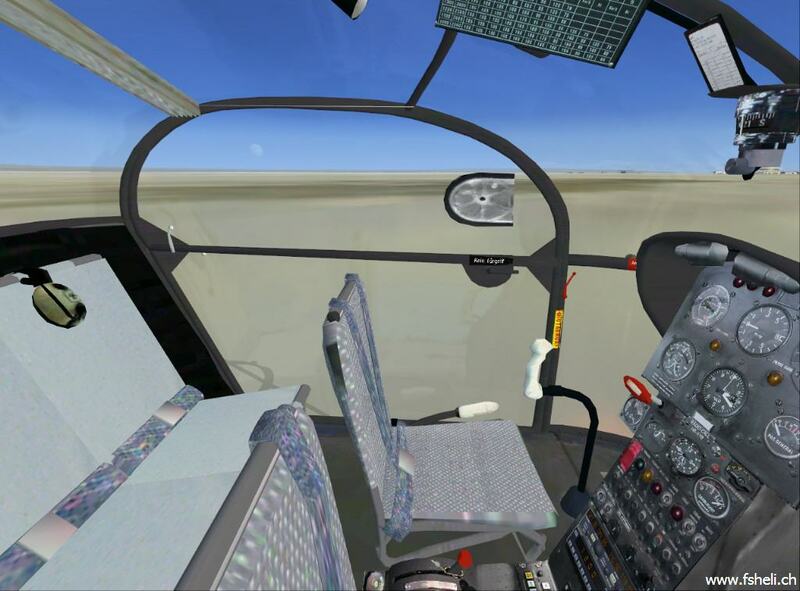 I have uninstalled the chopper temporarily until I have some time to work on alternative sounds so I am going by my memory of when I last flew it, (around January 20th 2013), and, because I flew it on a system that was not configured for FSX as well as it could have been and didn’t have the power/performance of my present build, I’ll refrain from reviewing my experience with the Alouette regarding performance and FPS efficiency. 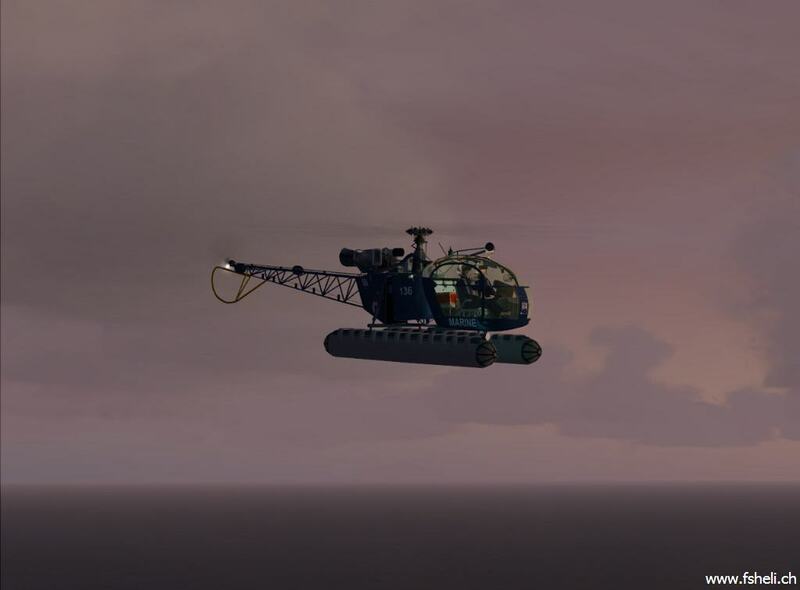 I will come back to that in the near future along with a possible alternative sound replacement. 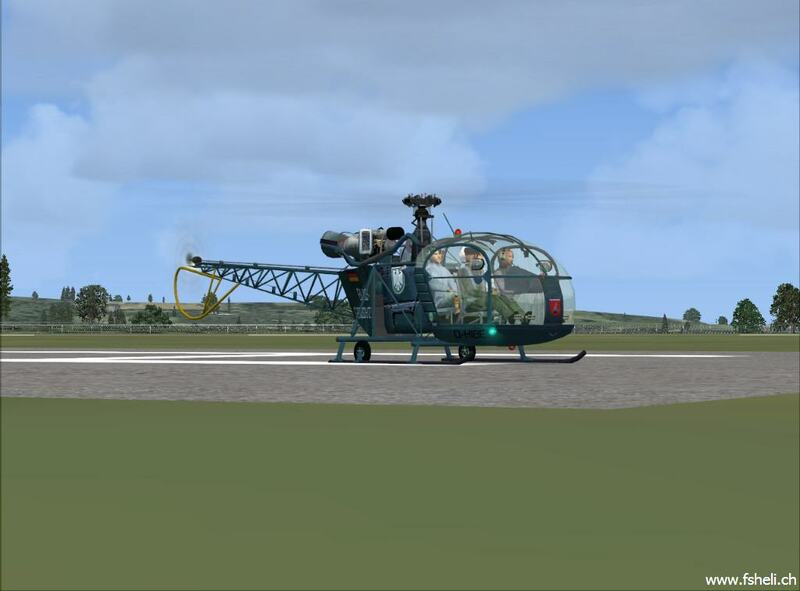 Its 2012 and its still a very good add-on.  still live's op to today's standard!! 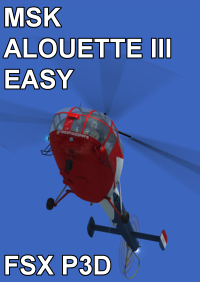 As someone who has been eagerly awaiting the release of the Alouette I can definately say that this package lives up to every expectation. 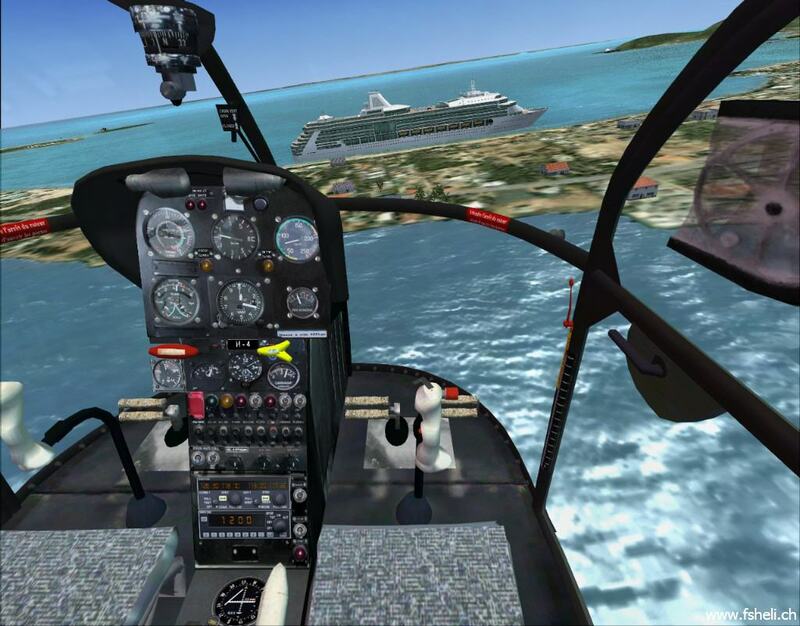 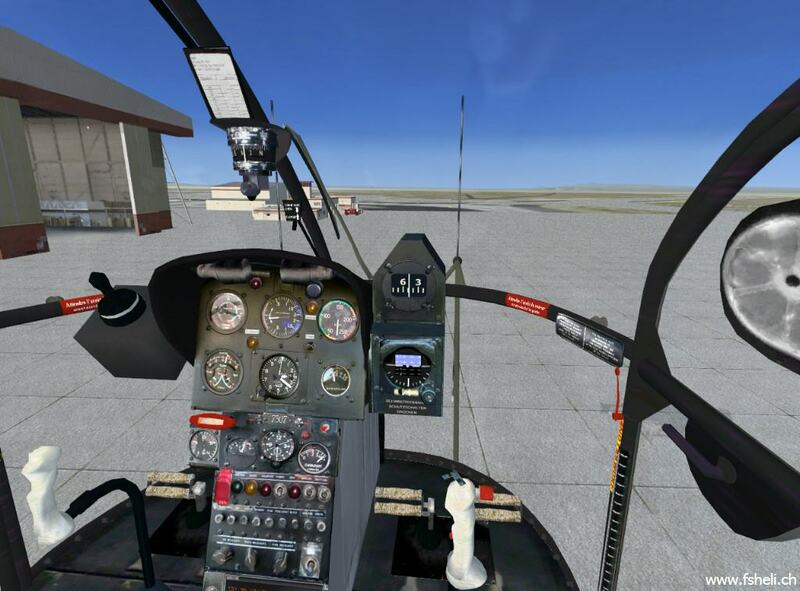 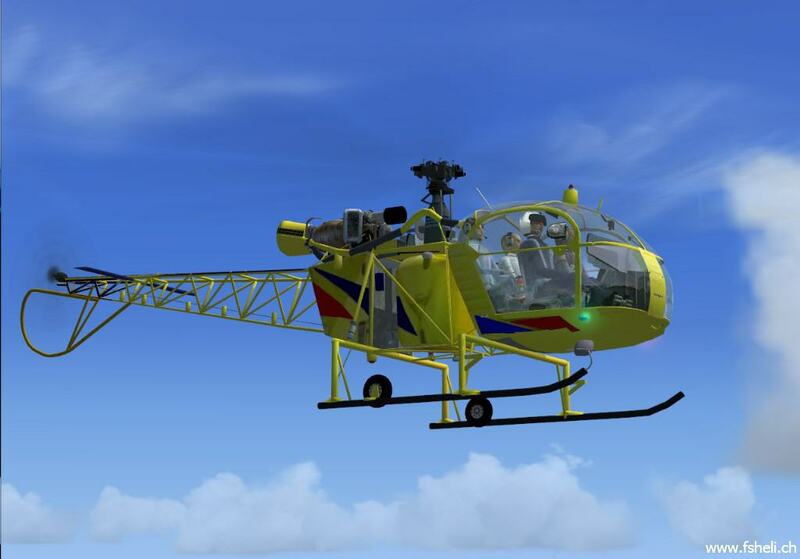 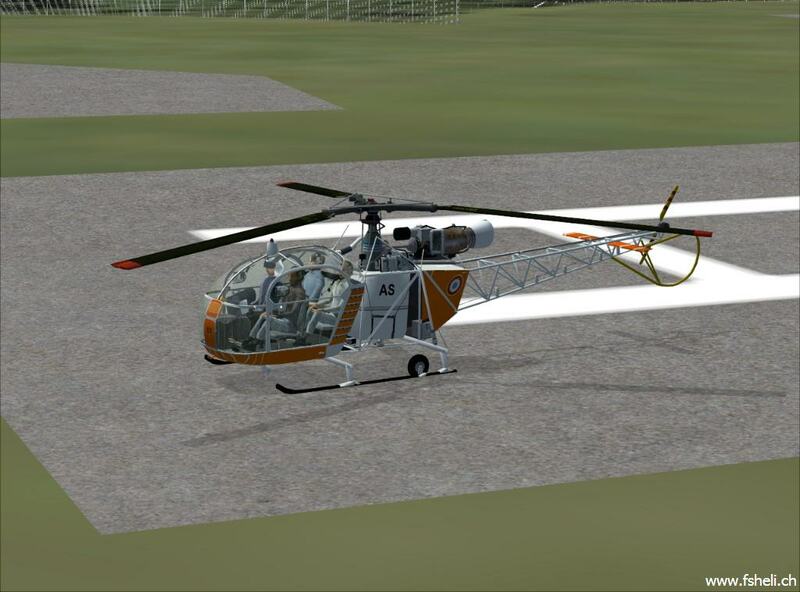 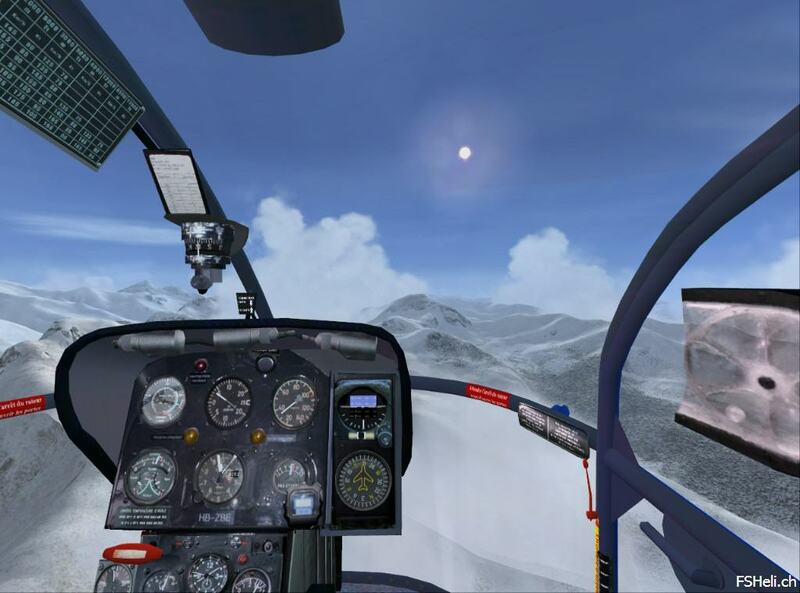 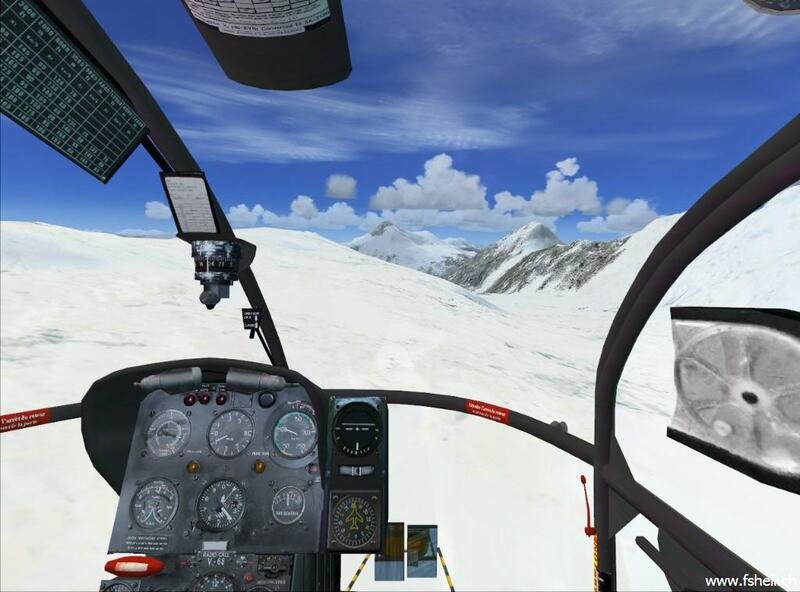 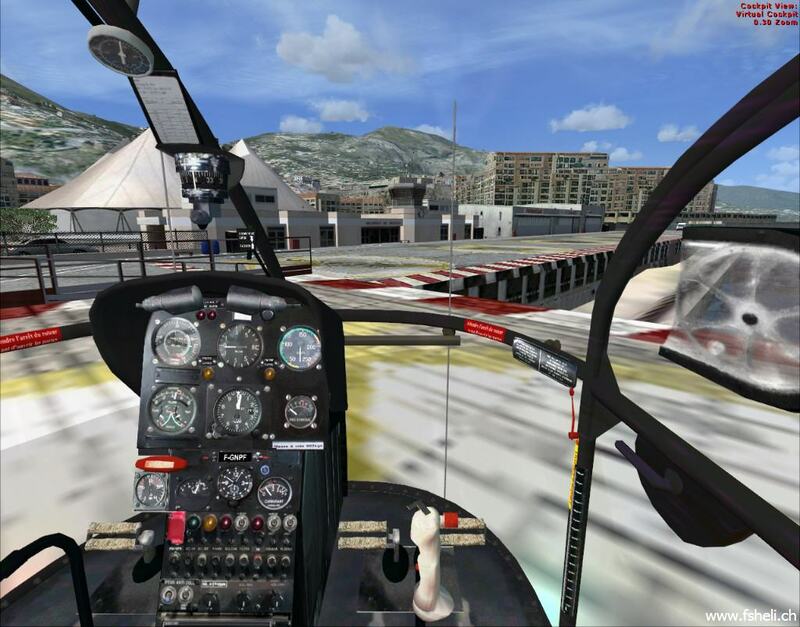 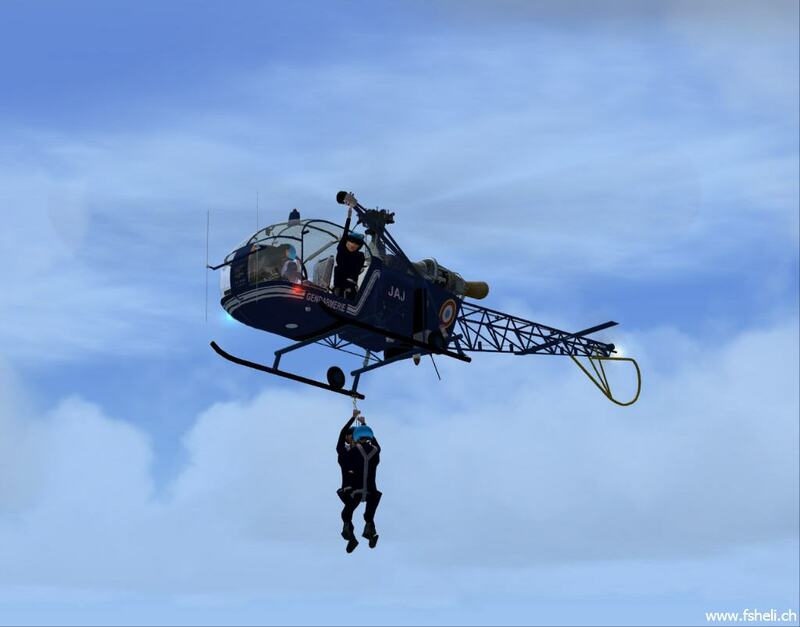 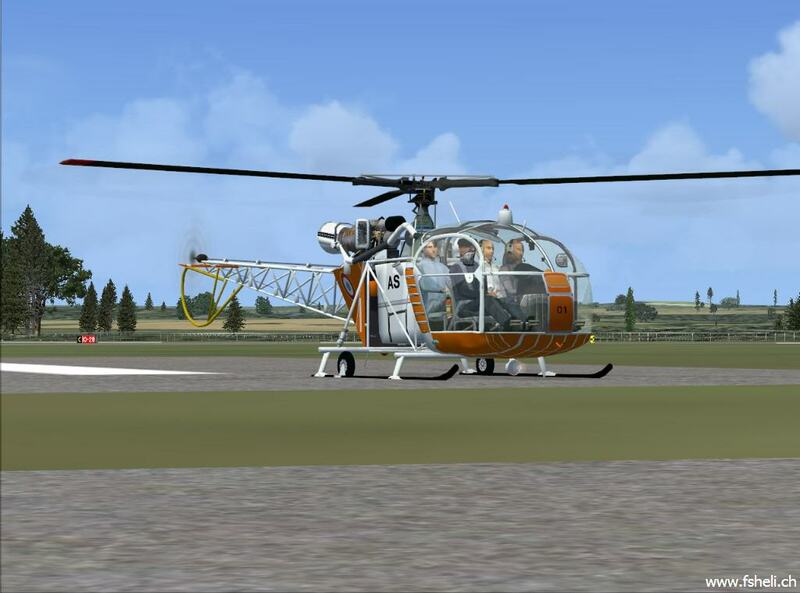 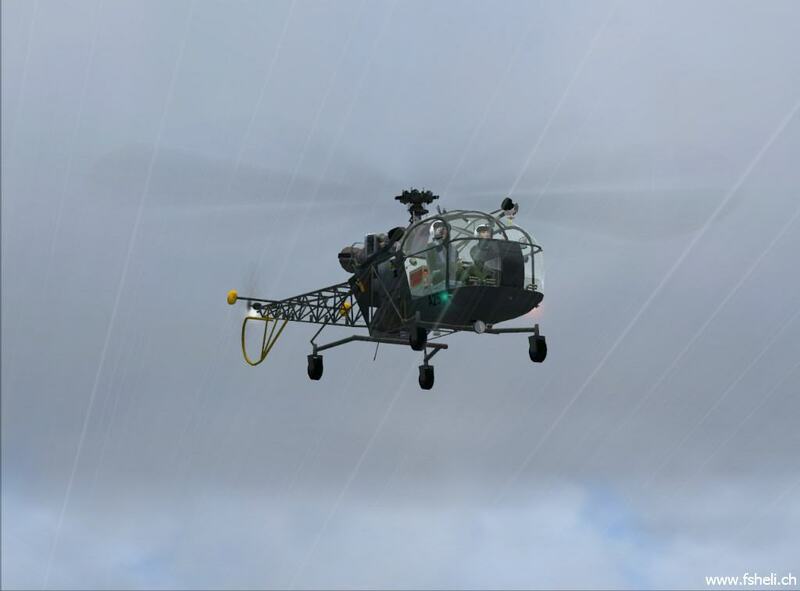 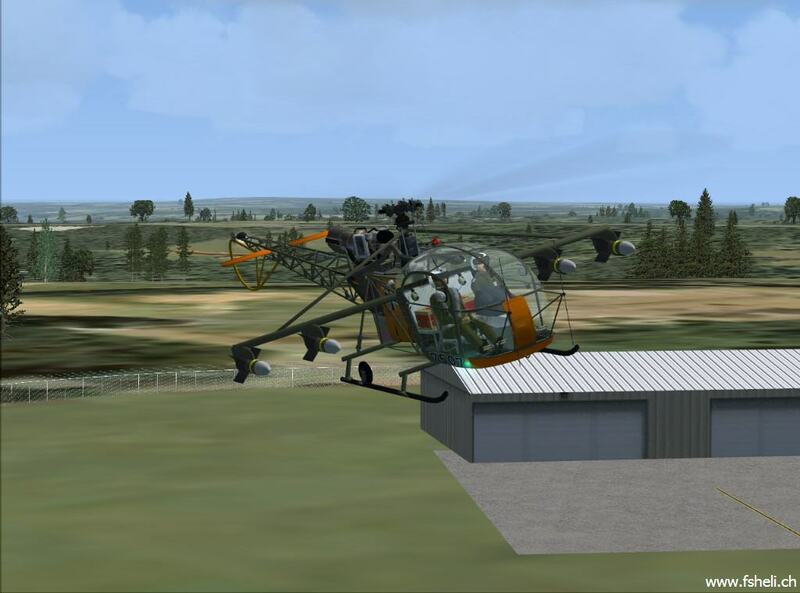 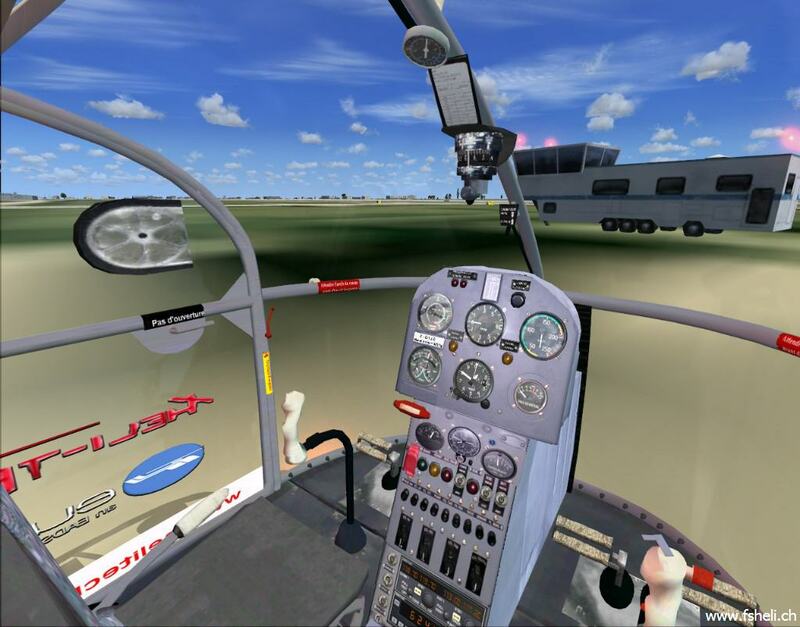 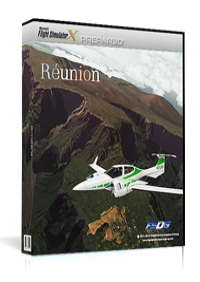 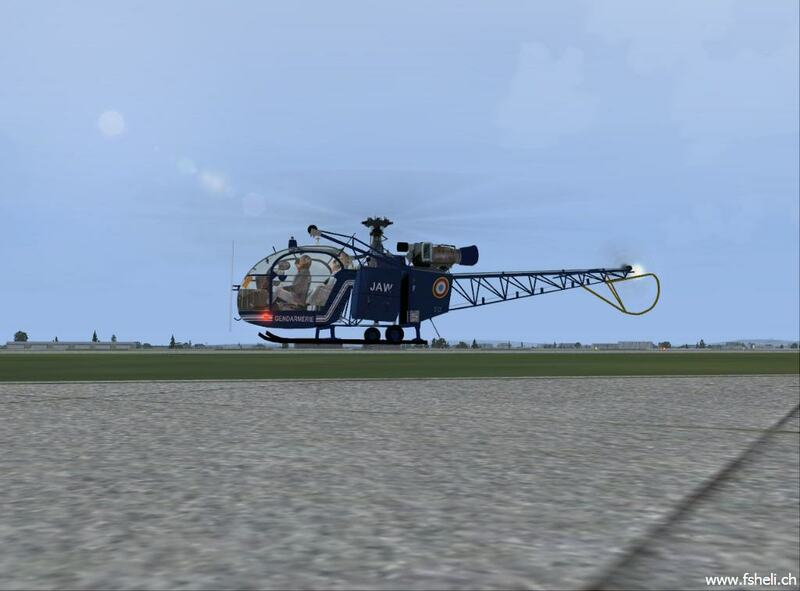 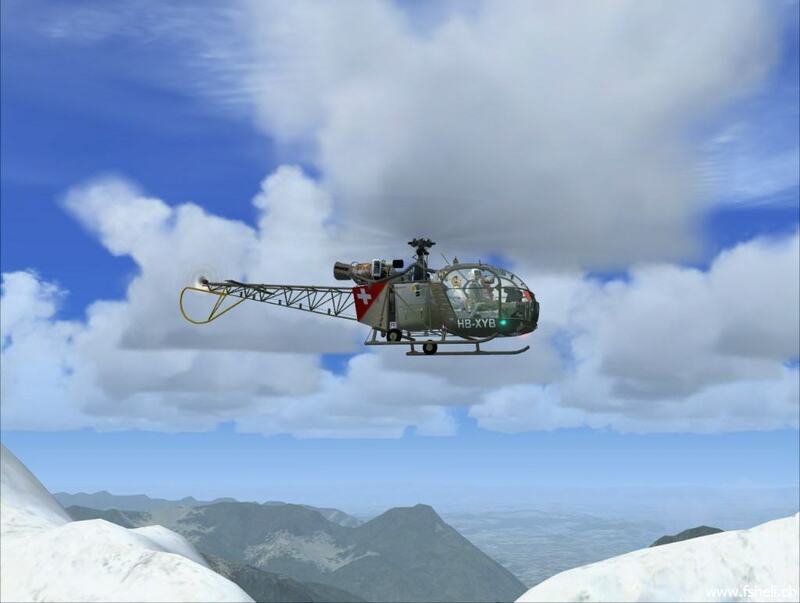 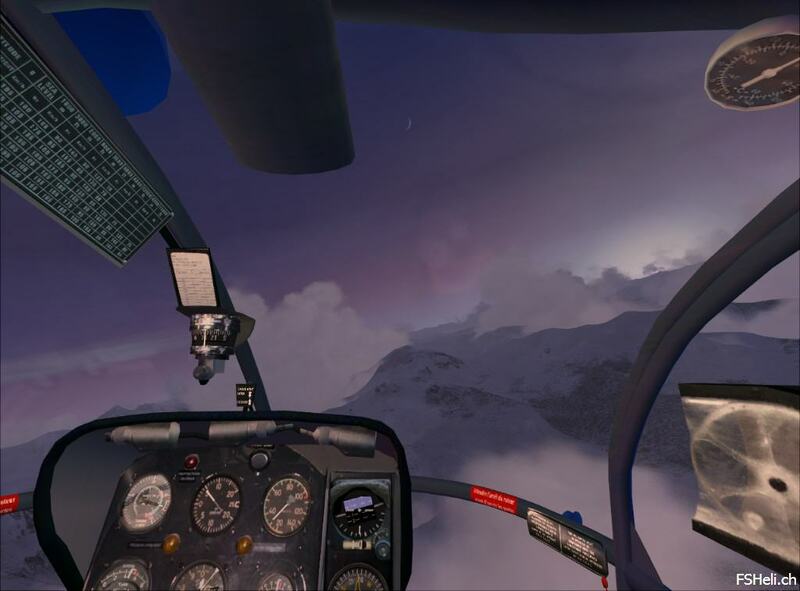 Whilst the FS Heli Lama was an excellent product compared to the many other helicopter addon currently available, the feeling of flying created by the very dedicated Peter Salzgeber has to be given every credit. 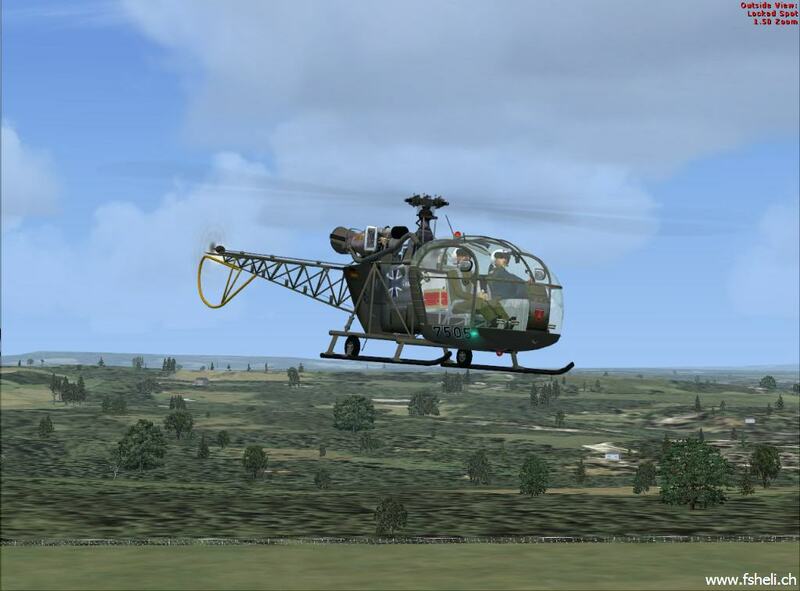 As a PPL H pilot I gain great pleasure from flying the Alouette. 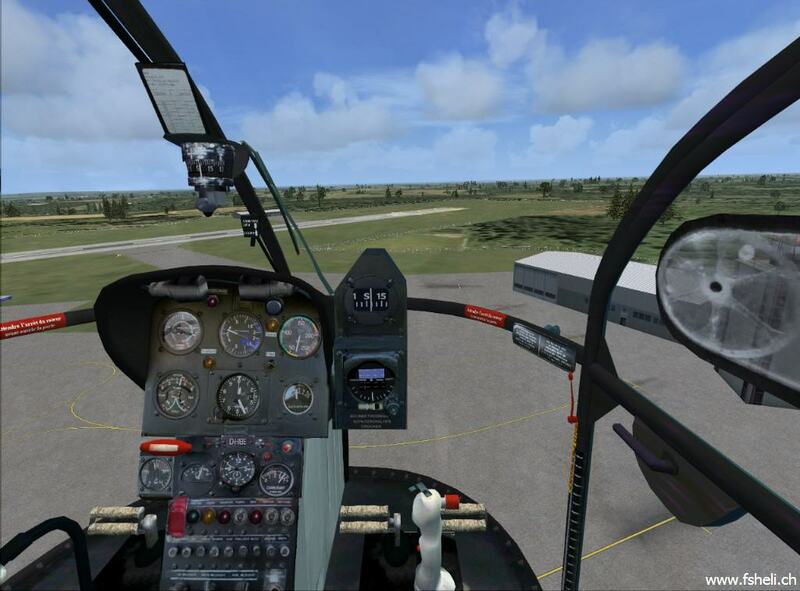 It is made real by much more detail and texures both inside and out, which still allow very high frame rates. 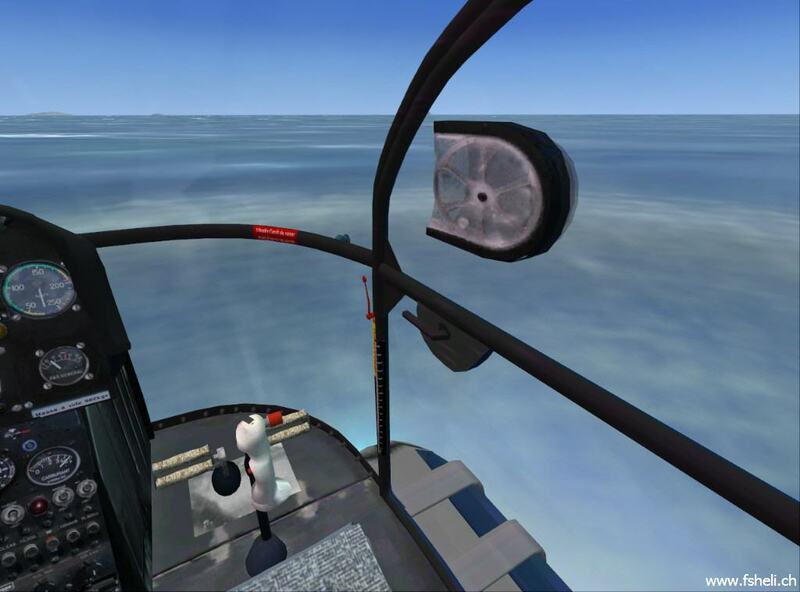 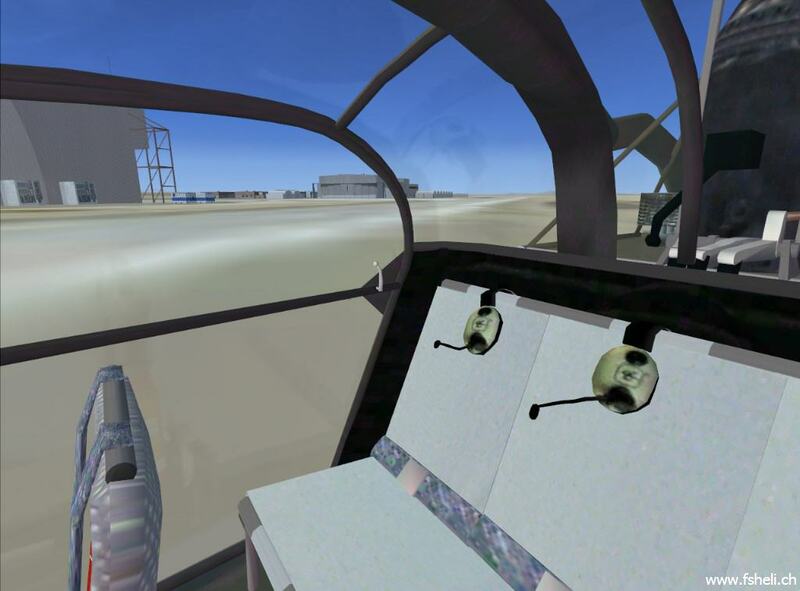 Peter has also ensured that the VC has great reflective glass within the canopy - something many of the other developers fail to include and make it feel like your flying without any windows. 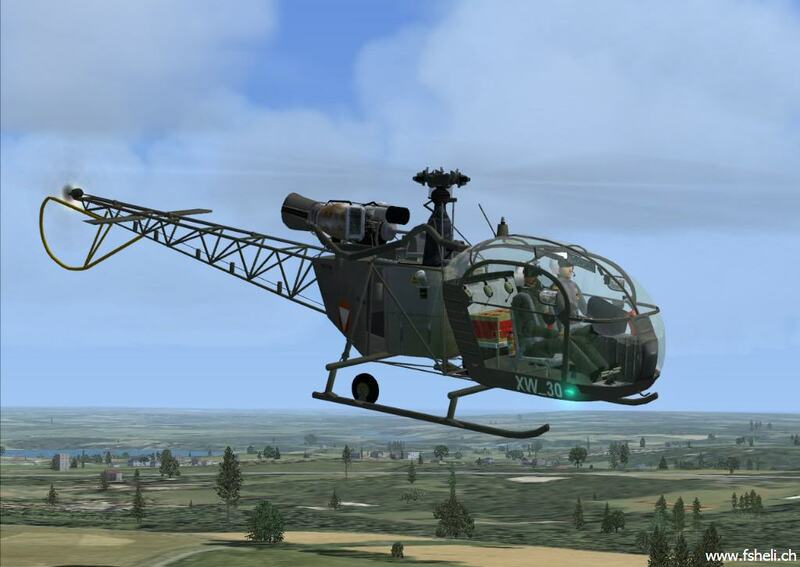 ce of my present build, I’ll refrain from reviewing my experience with the Alouette regarding performance and FPS efficiency. 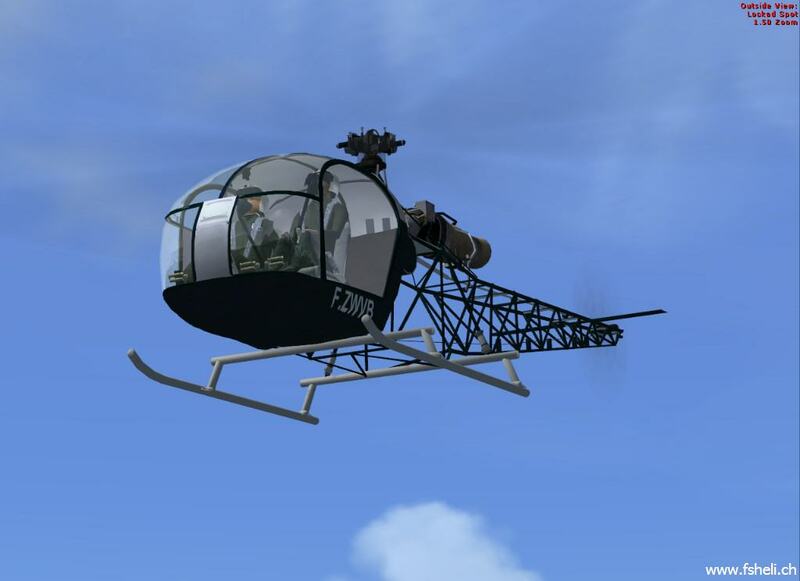 I will come back to that in the near future along with a possible alternative sound replacement.